So, just HOW excited would you be to get AWAY from your job for a week? 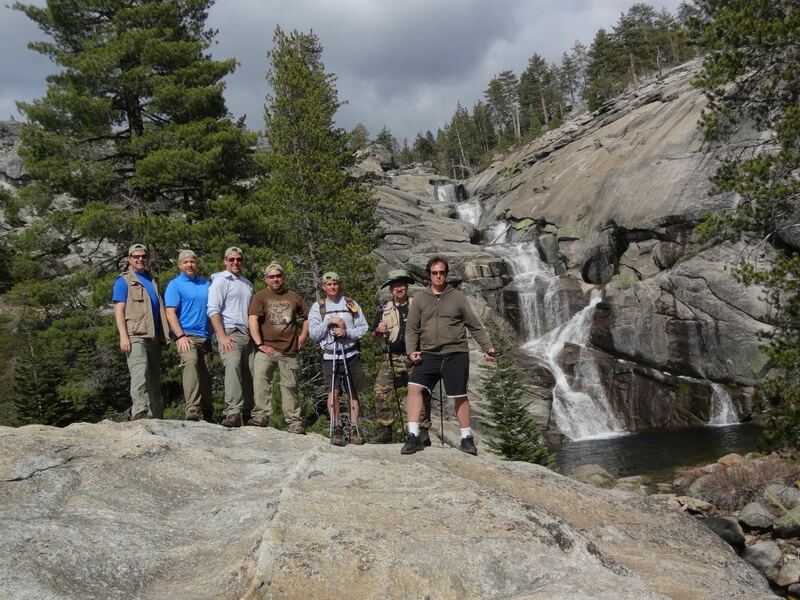 Yosemite Summit is a week long sabbatical retreat for men in the heart of Yosemite National Park. This is not camping. This is a week at a relaxing lodge for refreshment, renewal and recharging away from the hustle and bustle of fast-paced ministry life. 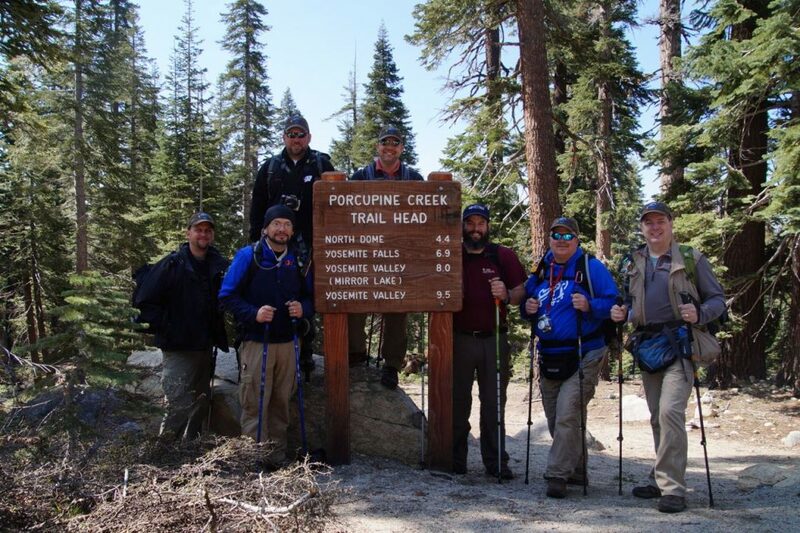 You can leave your watch behind as there is no schedule other than eat breakfast, hike, chill, and return for home cooked dinner in the evening enjoying fellowship with other men during the day. Oh, and there is only ONE SPOT LEFT for the 2019 Summit. Explore this site to learn more or register here! I’m praying for that one guy who really needs to join me on this 12th annual Summit. Will it be you? 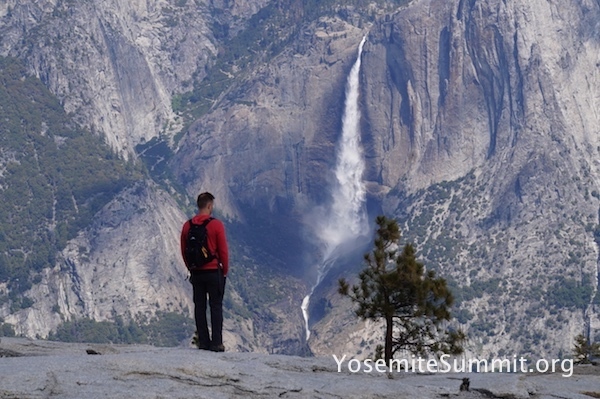 The 12th Annual Yosemite Summit is now OPEN for registration. 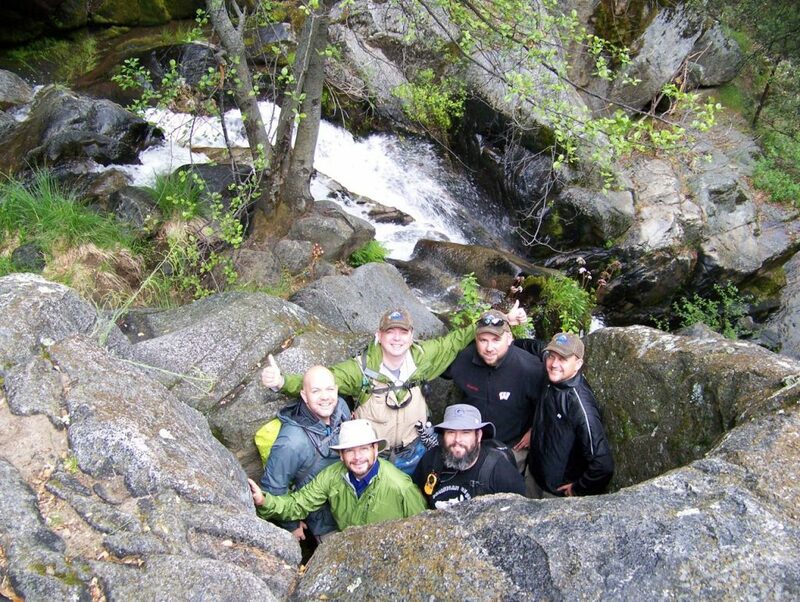 This unique sabbatical event for men in ministry is unlike anything else you have ever experienced. 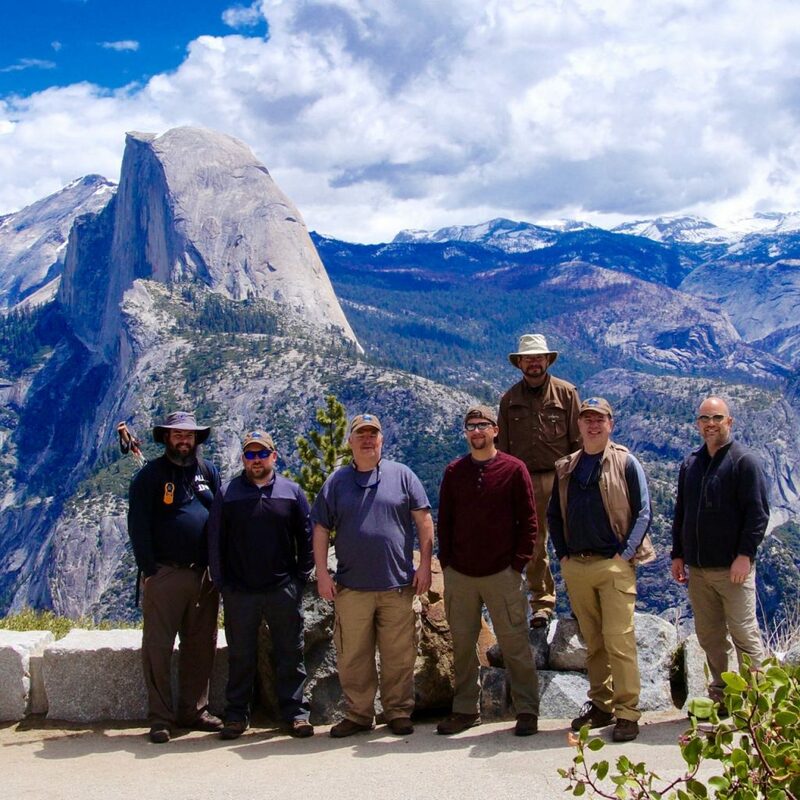 Limited to a small group of men, Yosemite Summit is a chance to walk away from everything, quite literally, and spend a week in one of the most breathtakingly beautiful places on earth enjoying focused time with God with some other men who share your passion for ministry. Yosemite Summit 2019 will be limited to six men, so register soon if you would like to join Pastor Karl on this incredible event. The dates are May 19th to 24th, 2019 with travel on the 18th and 25th. Complete details are on this site. If you have any questions, feel free to contact Karl. Every Summit is amazing. 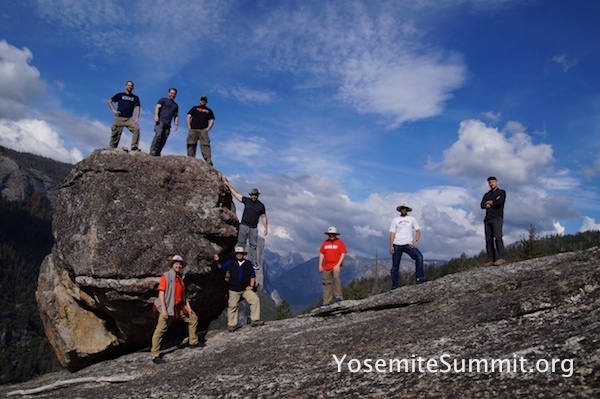 There has never been a “bad” Yosemite Summit. 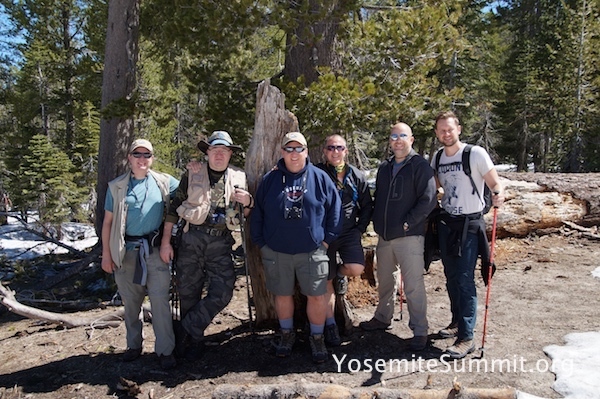 Each is unique, but the 11th annual Summit was uniquely special. The weather was great, the hikes spectacular, the fellowship rich and we had some hysterical fun! 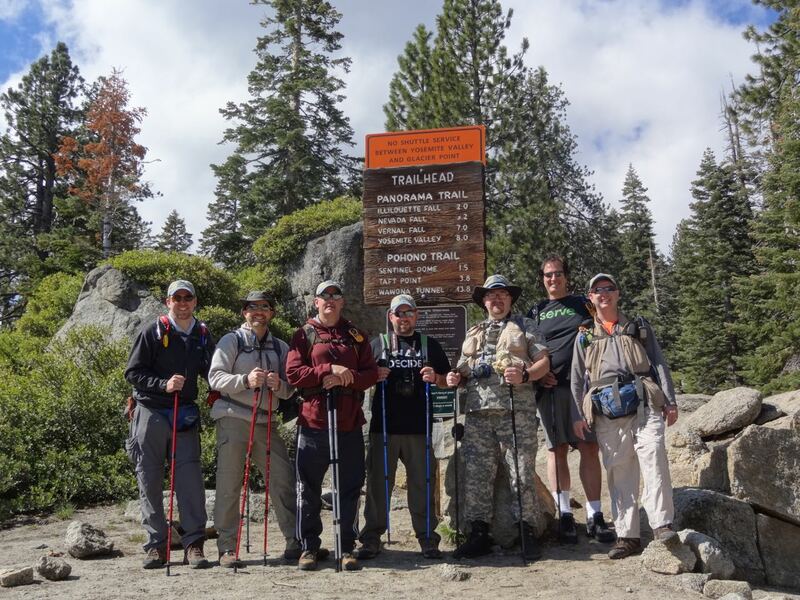 Some of the crazy memories aren’t even for sharing here on the website, they are just for the guys who attended to cherish, which is probably why so many guys have come on the Summit year after year – several have come three to five times! As I head into the second decade of leading these, I can’t help wondering how many of these I will do until I head to the final eternal Summit. Of course, we always try for what we call our “Album Cover Shot” too. 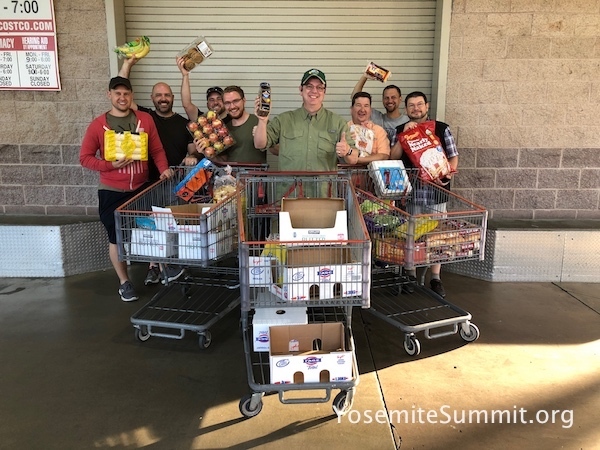 Ever seen a bunch of guys in a giant warehouse store stocking up on food for a week of cooking? I’m sure our wives would find it very entertaining as we wander the store with walkie talkies making sure we have everything. No, worries – we’ve got it down to a science after ten years. The first year I had my wife on the phone the whole time we were shopping! 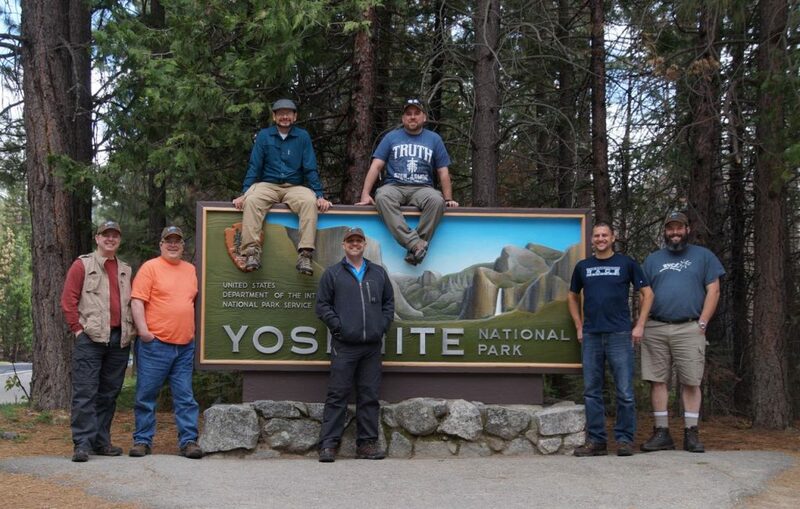 Soon we are in Yosemite and ready for some great fellowship and prepared to see some amazing things you just can’t see at home! 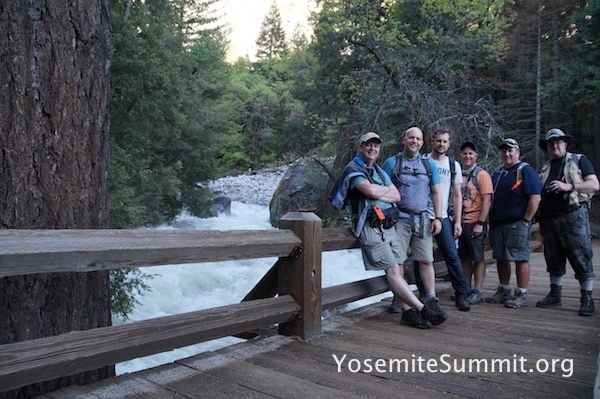 One of the best things about Yosemite Summit is the friendships that are formed and deepened over the years. No, that isn’t a green screen backdrop. 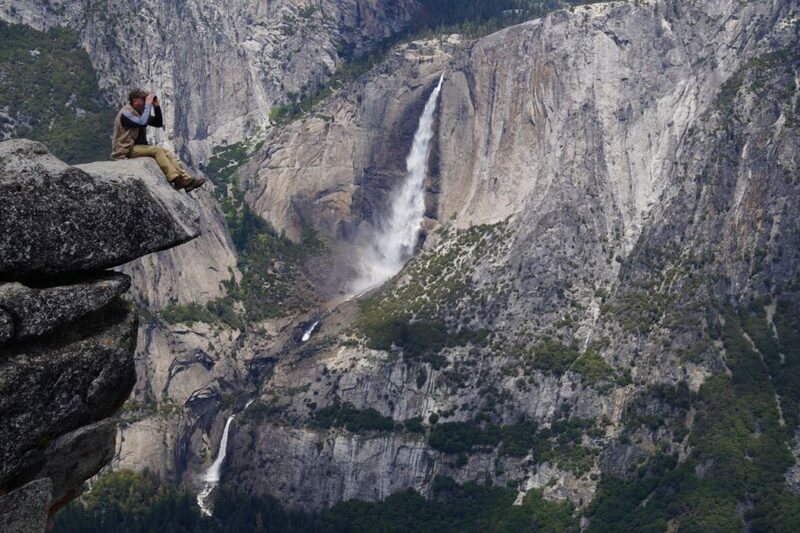 It’s just that incredible in Yosemite. Other times you are standing next to a thundering waterfall. Later, you are on top of the world! And then later, you are chillin’ next to a peaceful river. 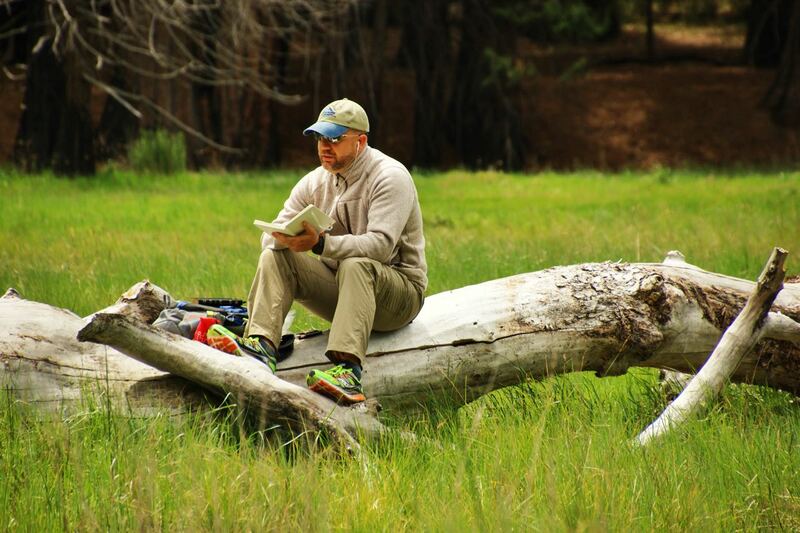 It’s a time for quiet reflection away from the constant interruptions from smart phones, meetings, and yes, even people… so you can hear from God. When is the last time you got to just sit and think. And ponder. And reflect. And pray. 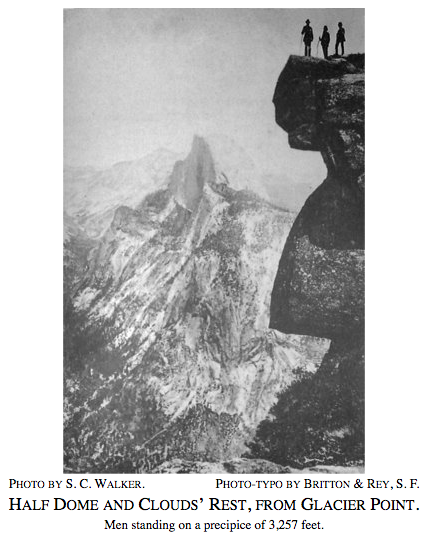 When you gave at God’s magnificent creation that is pretty much unchanged from how it looked when Abraham Lincoln and Theodore Roosevelt gaved upon it, it gives you a powerful perspective on God’s timelessness and demonstrates just how much not in a hurry He is to accomplish His purposes in your life. 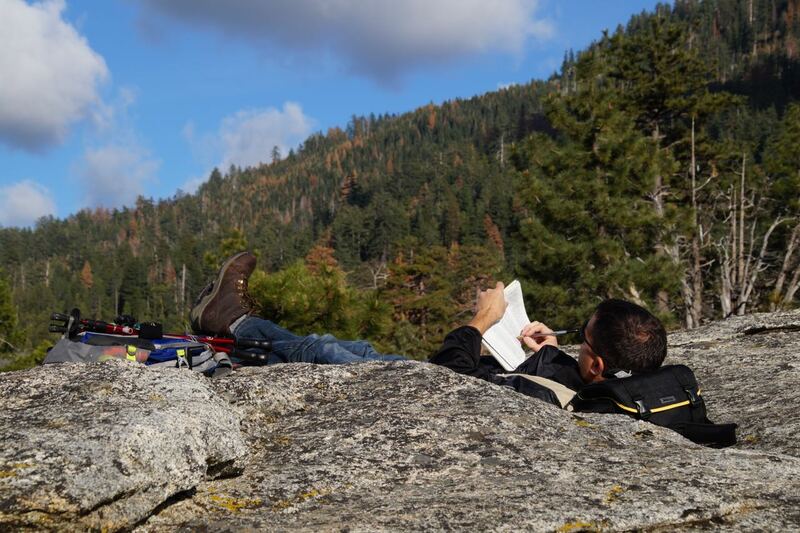 I can’t even describe how nice it is to read God’s Word while enjoying His Creation. Or to just take a nap listening to the symphony of creation. 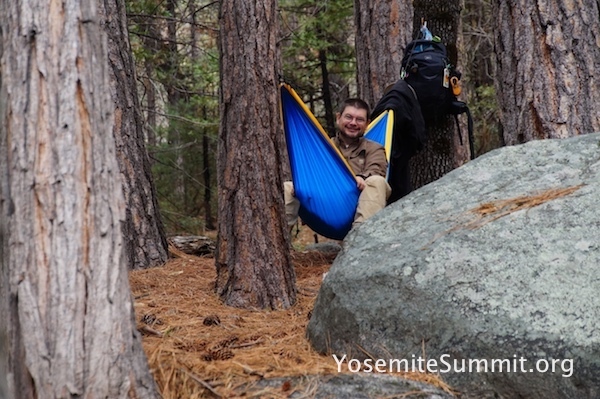 A few guys have brought hammocks over the years. 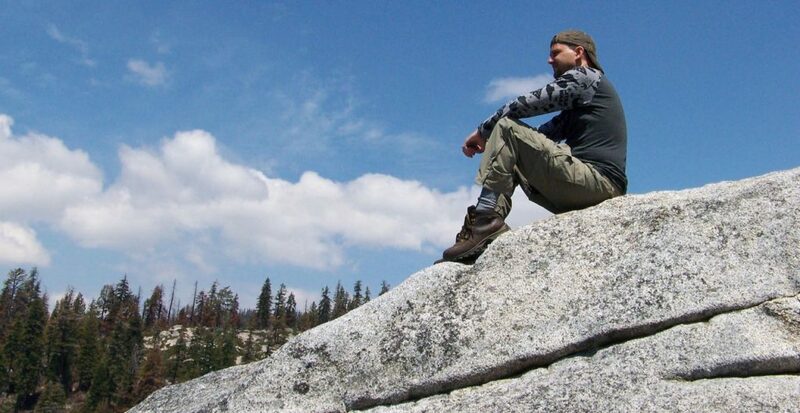 Finding that perfect spot each day to pause, meditate and reflect is the goal. 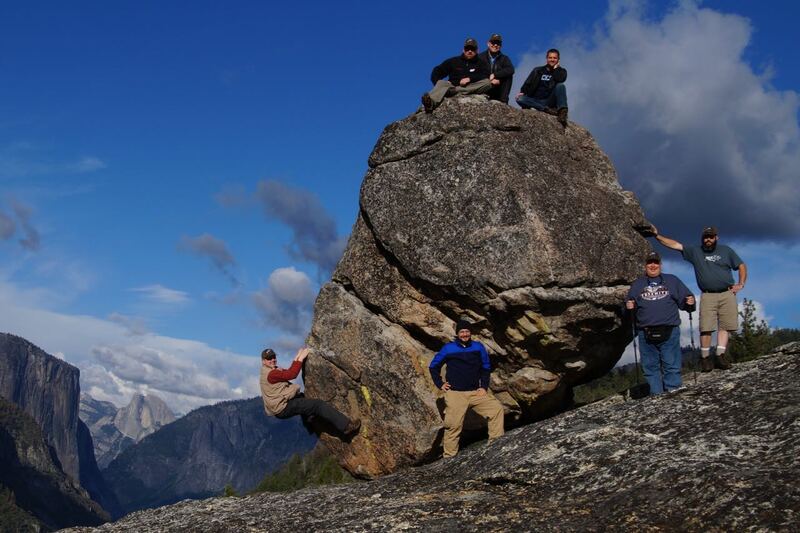 Everyone wants that mountain top experience, even if it really is just a ten foot rock that makes a great picture. 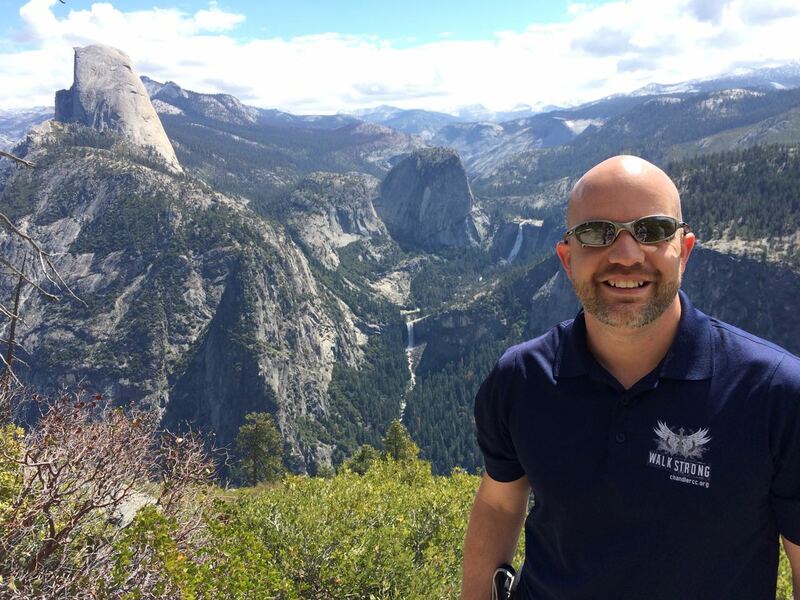 But spiritually, there are many mountain top experiences that occur! Walking with God and walking with others who share your passion for ministry and discipleship makes for insightful conversation. 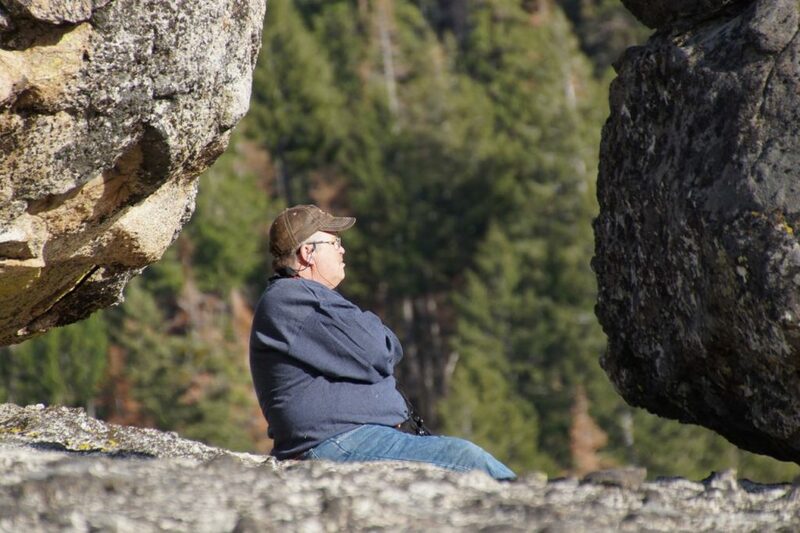 I love to chill and just take in the vast vistas. I’ve been trying to figure out how to freeze time while I’m there, but so far I’ve had to settle for just living in the moment and savoring every minute knowing that the experience is rich but limited. It’s amazing to me how long the week feels when you take in every hour deeply. The week truly does not feel like it rushes by as normal weeks do. I am so refreshed at the end, I feel like I’ve had a month off. 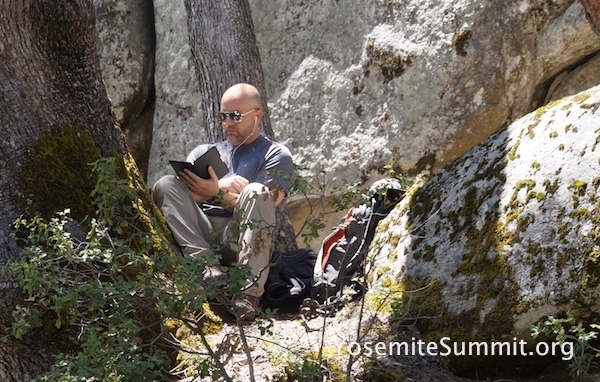 Yosemite Summit is a time of reflection – on your own life, relationships, ministry and future goals. It is a time when you can hear God so clearly because all the normal noise of life has been removed. 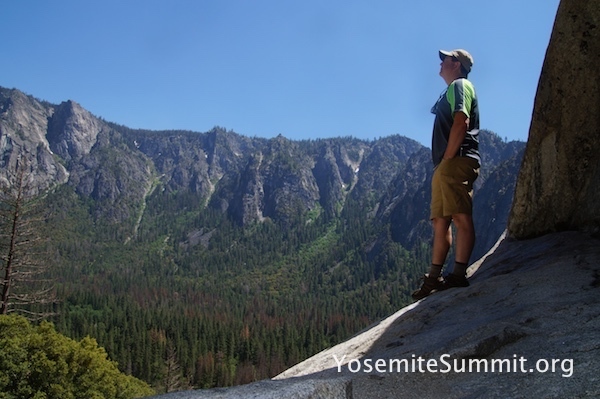 Yosemite Summit helps you gain new perspective on life and ministry! I can’t believe that next year will will be the 12th Summit! 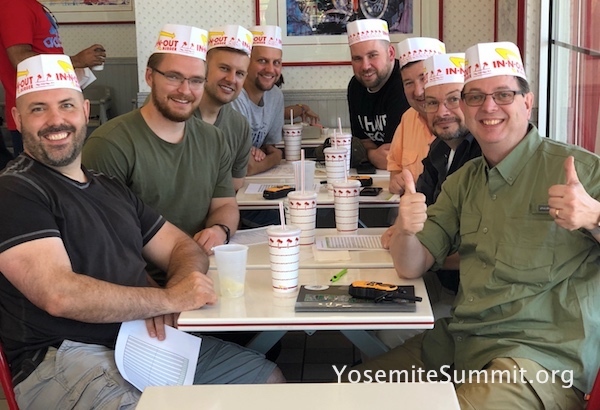 I’m so curious who God will send with me on the Summit – it’s always so fascinating to me to see the group that God assembles. 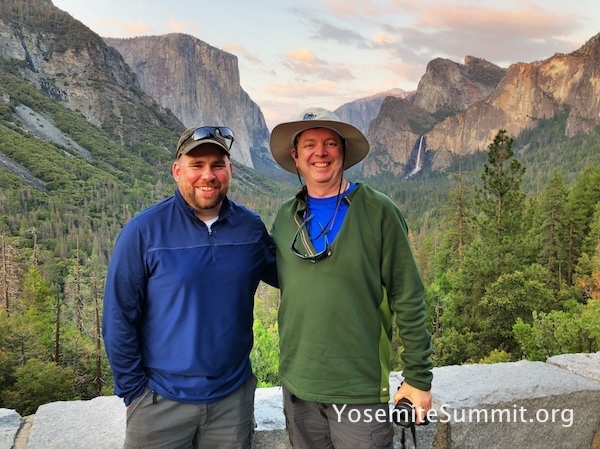 I enjoy my primary ministry as a children’s pastor, and I thoroughly enjoy the opportunities I get serving leaders in children’s ministry through Kidology, but I must say, Yosemite Summit has got to be one of the most surprisingly enjoyable blessings in my life. It was born out of my own need for renewal and refreshment over a decade ago, and the fact that it has since impacted over fifty other men is both humbling and an honor. Are you going to join me next year? 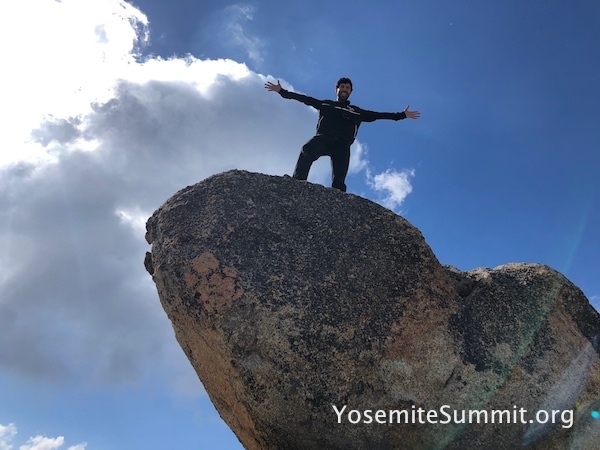 Explore YosemiteSummit.org to learn more. Know what might be the best thing for your ministry right now? This may surprise you – but the best thing for your ministry right now may be to get as far away from it as possible – and to get a close to God as possible. 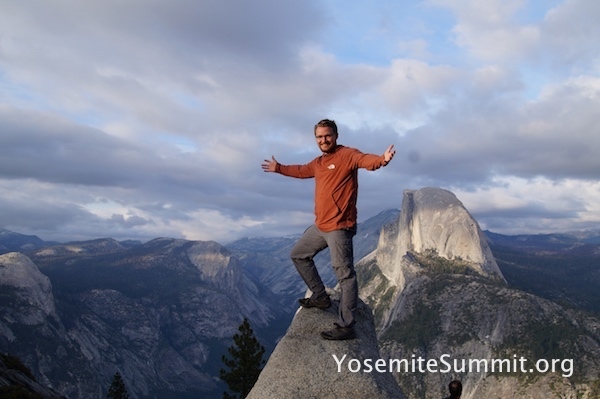 That is what Yosemite Summit is all about. It is about focusing on what matters most to your ministry: your walk with God. Your soul. NOTHING is more important and nothing will impact your ministry more than your private walk with God. Come join a few other children’s pastors and walk with God for a few days and let Him speak you directly. 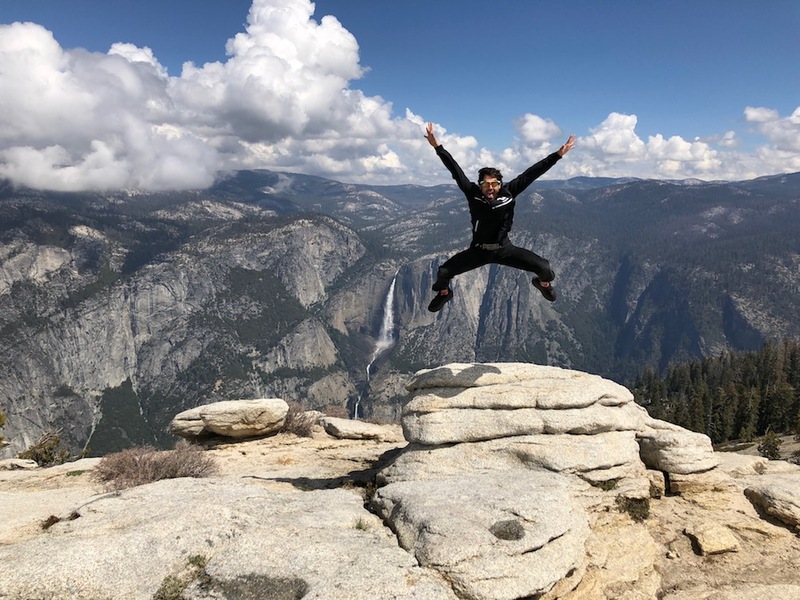 Through nature, though worship, through fellowship, through the Word, through the quietness you may only find at a sun rise at Glacier Point or in the midst of a thousand foot water fall. You will never be the same after meeting God here. Cast off the excuses, and allow God to provide if He is hinting in your spirit that He wants you to get away with Him soon. Comments Off on Have You Heard God Whisper? A NOTE TO CHILDREN’S PASTORS: My guess is that you haven’t heard the forest break out into uproarious applause or the mountains burst into joyful song. If I were to pry, I’d be willing to guess that, for some of you, you go home unable to hear even the gentlest of whispers from God’s tender love and approval of your service to His little ones and His church. There is a grind to ministry that if left unchecked will lead to deafness to God’s unending joy in your service to children. Even if this doesn’t describe your current state or you’re feel really great about your ministry and relationship with God, I offer this gem: Join a Kidmin UNconfrence! 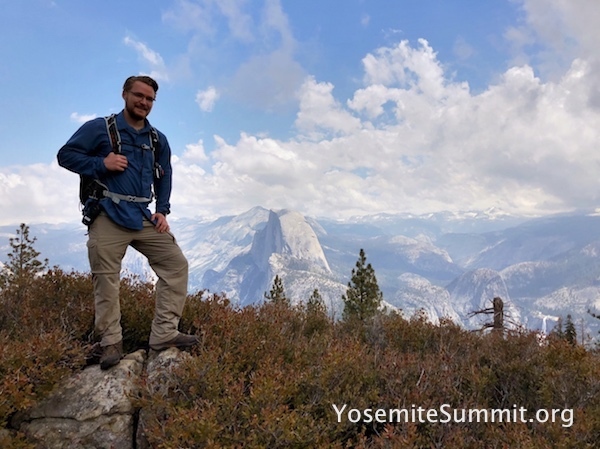 I’ve been a part of Karl Bastian’s YosemiteSummit.org for the last three years. It breaks up my crazy hectic ministry routine with one solid week of renewal, refining, refocusing and ultimately a new resolve for God, family and church. If you’re a male children’s ministry pastor/director and you’ve read this far than YES this is for you and you know you need this! Drop the excuses, don’t stress about the how and just pray on it. 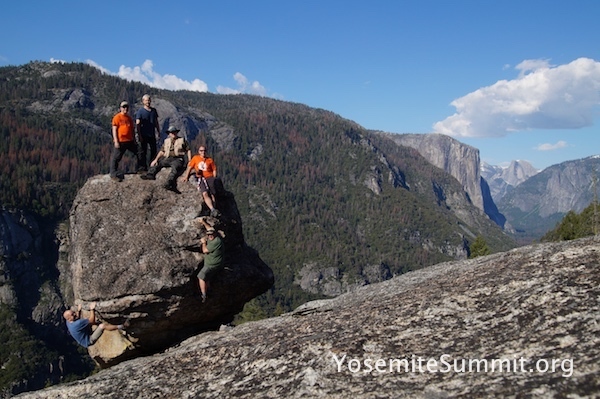 Then register for Yosemite Summit. Karl is genuinely passionate about seeing men reconnect to the God who has called them into ministry. 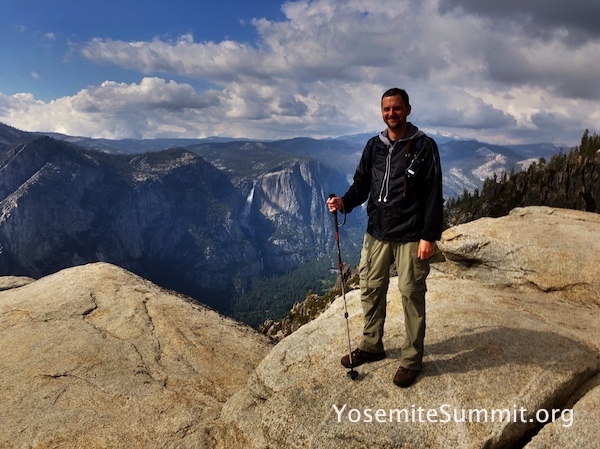 Even as I write this, I still can’t believe that I’m reporting on the 10th Anniversary of Yosemite Summit. 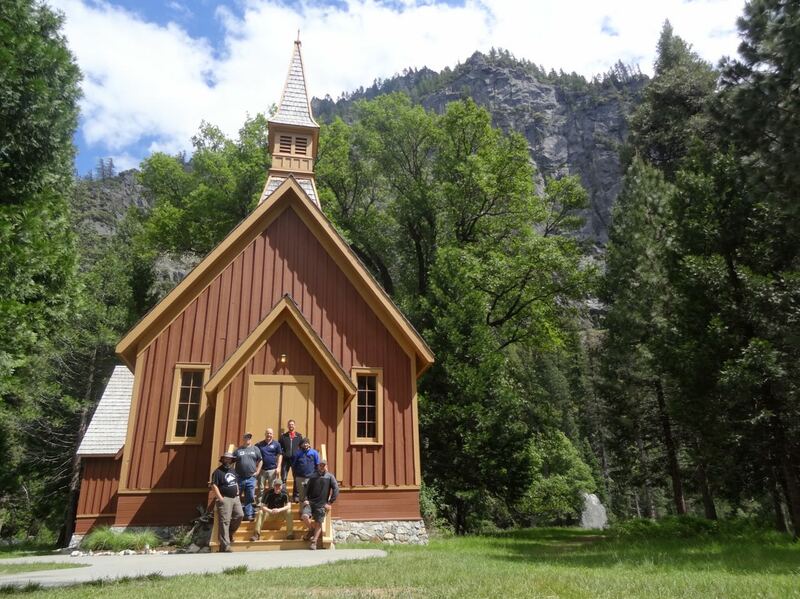 When I first got the idea to do this sabbatical retreat for children’s pastors, it was a step of faith. 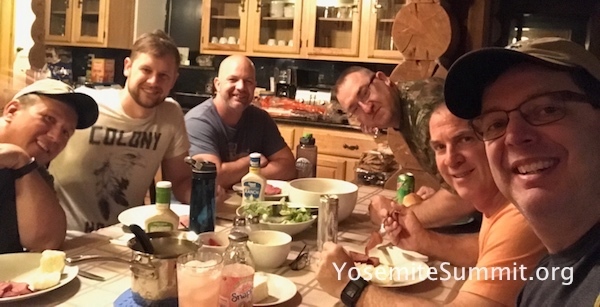 While I hoped it could become an annual event, at that time, I didn’t even know if I could get enough guys to join me to make the event succeed. And now I’m planning the 11th annual. Here are some pictures from the 2017 Summit – and a highlight video at the end. 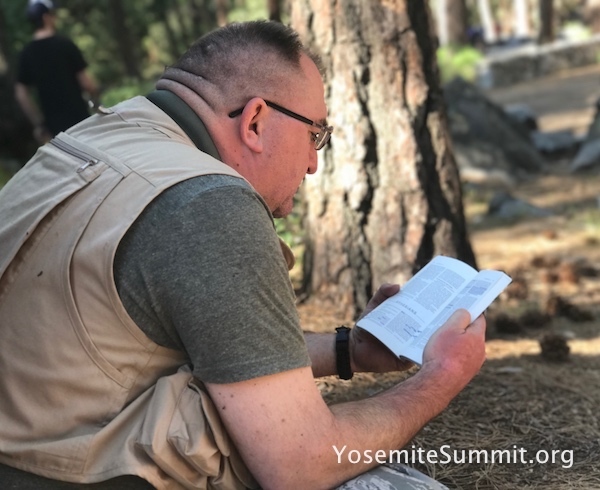 It is my prayer these will not only encourage guys to join me on a future Summit, but also challenge YOU to set aside time to intentionally plan rest into your busy ministry life. This event grew out of a period of life where I was beyond exhausted even as I was doing what I loved – children’s ministry – and when I discovered that I as much as I love what I do, God needs ME more than anything I do for Him. This annual week is my gift to Him – 100% of me for a full week, ceasing from doing to just BE. And it is a gift I invite other men to join me on. 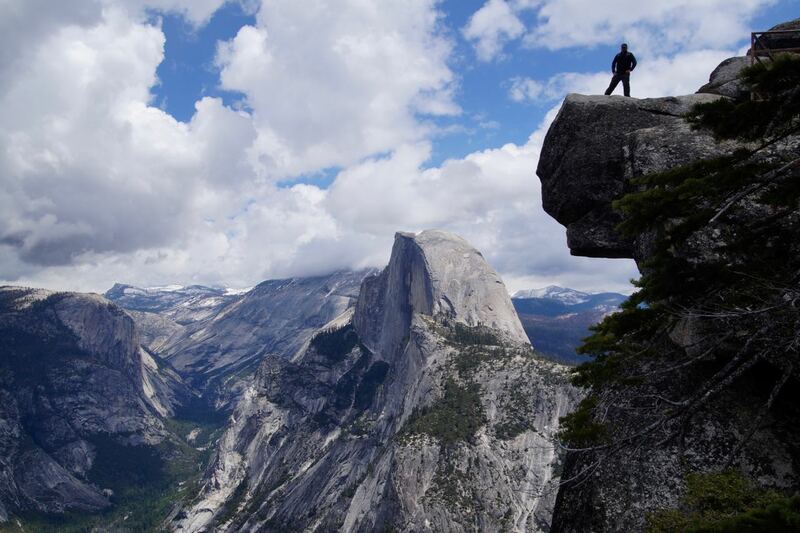 It is hard for me to even describe Yosemite. 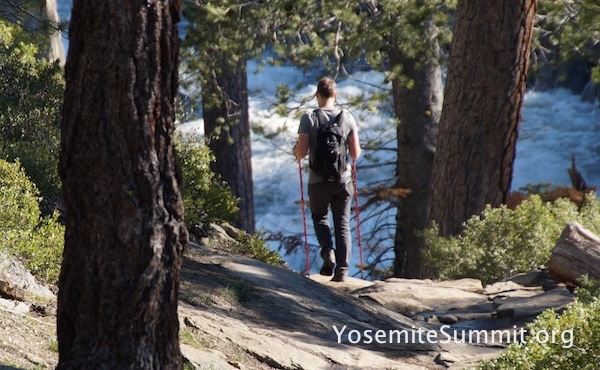 While millions of people visit every year, the vast majority only experience Yosemite from the crowded paved roads in the Valley. They miss out on so much that this majestic place has to offer! 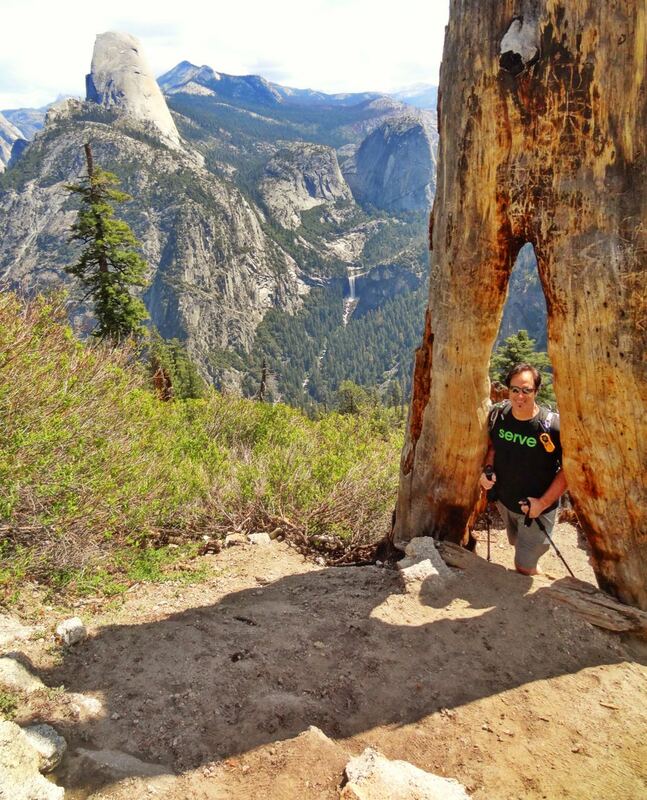 One of the most popular hikes we do every few years is the Panorama Trail, which begins at Glacier Point, where many drive to take pictures and then leave – but we hike all the way to the Valley, passing three major waterfalls in the process. It is an incredible day with views no pictures can truly capture. Peter was back after having been with me on the very first Summit ten years ago. The friendships that have grown out of this group of men is one of the blessings we all enjoy. 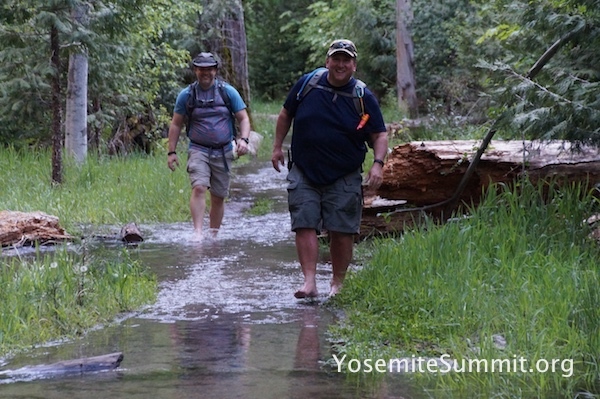 Both Tom and Matt have been on several Summits, and there is a reason many guys come back over and over – every years is different (like hiking in ice cold flooded trails for a bit this year due to heavy snow melt) but every year is special and rejuvenates the guys who come. 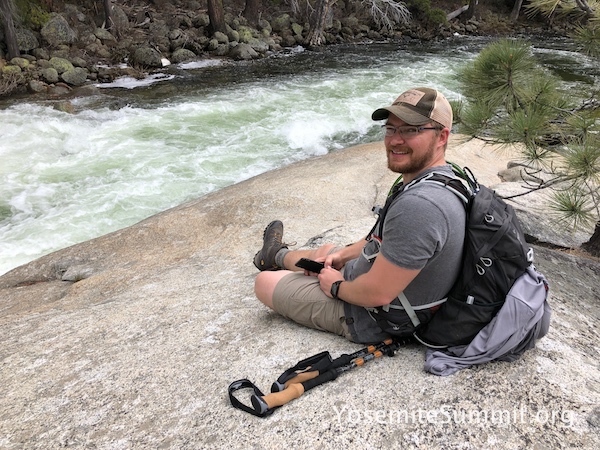 While we enjoy great fellowship with others who share our love of God, nature and children’s ministry – we also get some precious solo time to just walk. Whether we are enjoying worship music through our headphones or God’s music in the world around us, prayer is never so sweet or personal as it is here. 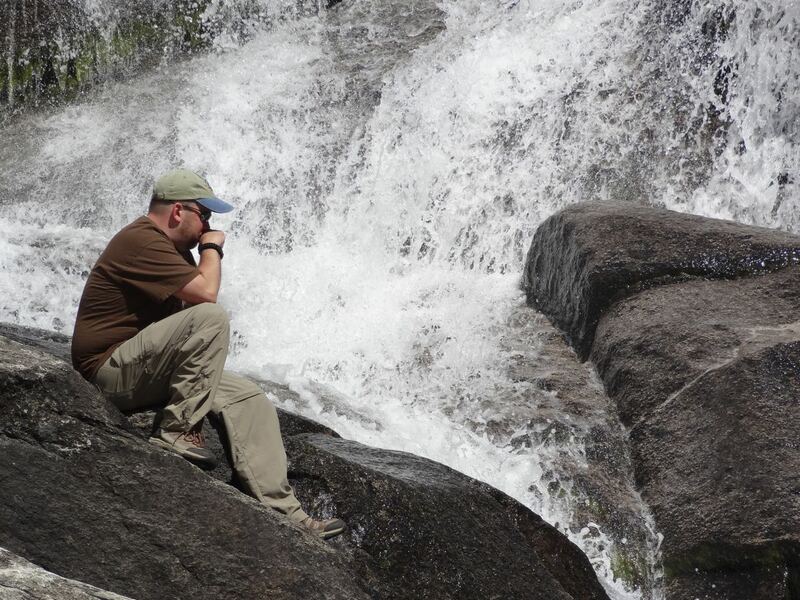 There are times when we are enjoying the thunderous noise of cascading waterfalls and rivers overcome with the power of God seen in His timeless creation. 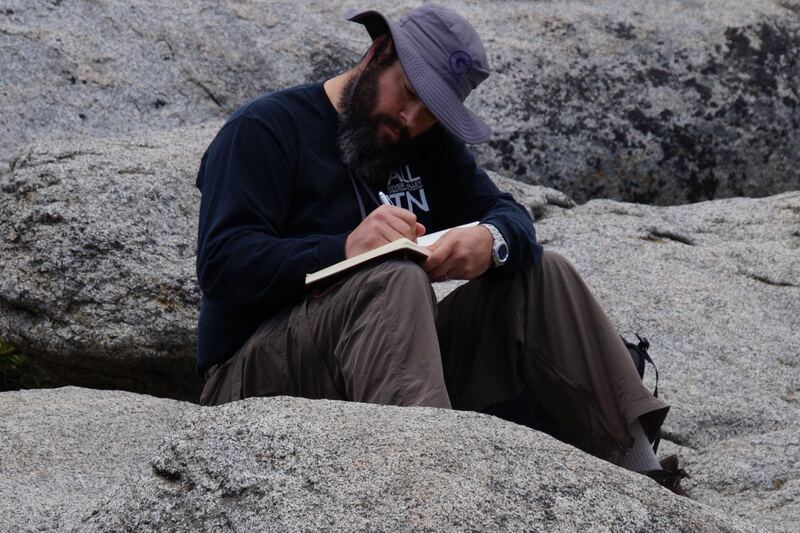 Other times, we get to just sit and read, journal and pray in a place where only birds, wind in the trees of the distant roar of water attempts to distract us. 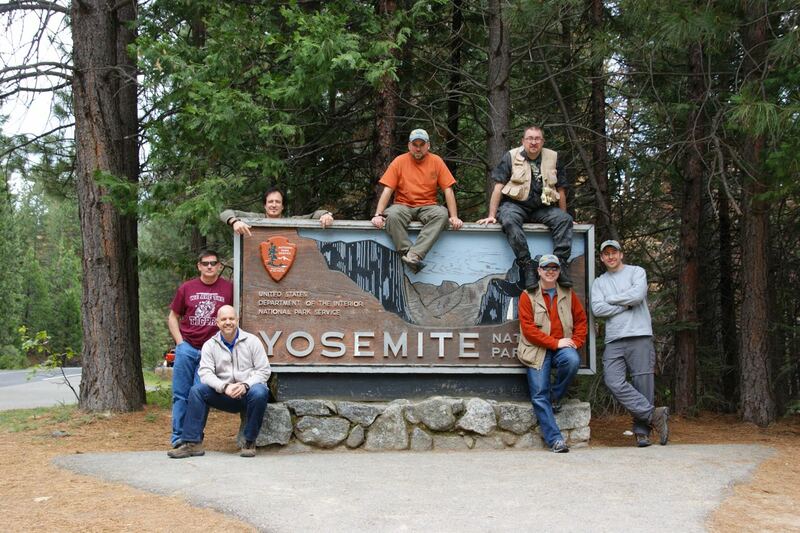 From the moment we gather in Sacramento, through the drive to Yosemite, and of course while we are there – we have so much fun just enjoying a relaxed pace of life. They quickly figure out – we have left deadlines and schedules behind us. In fact, they don’t even need to wear a watch. Because we don’t need them. The day starts when the sun rises and ends when it gets dark. In between, we just enjoy each other, God’s presence and all that He created to display His glory. 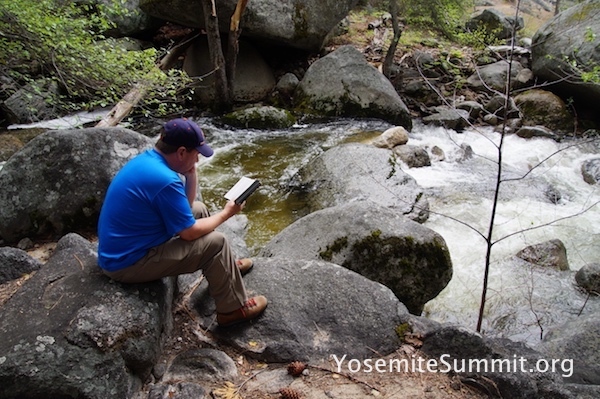 I have discovered many “hidden spots” over the ten yeas I’ve been visiting Yosemite. While I’ve done ten Summits, I’ve also gone with my family, a father-son trip with my dad, and twice in winter – most recently last January with my friend Pat, who has been on four Summits and jumped at the chance to join me in January, even as it meant missing the 10th anniversary trip – but he’s coming again in 2018, now as my co-leader due to his experience with the event. For the 10th Anniversary Summit, I opened the event up first to repeat guys, and it filled so fast, I never even got to promote it on Kidology for newbies to come. But we did have one first timer, my good friend Jon Mobley who I’ve been inviting for years and he was finally able to come. 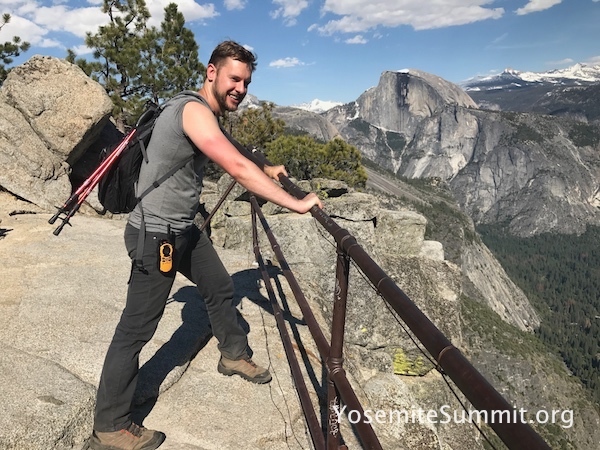 He joined me and a few others as he made it to the top of Yosemite Falls and then up to Yosemite Point – a daunting hike that only two guys have done in the ten years of Yosemite Summit. It was on my bucket list, and I finally did it! 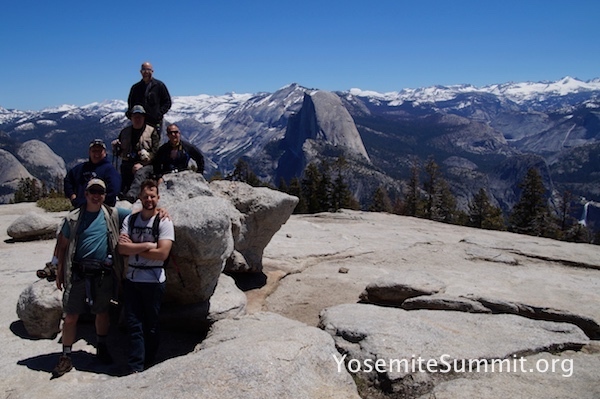 We love Half Dome – the iconic mountain that attracts hiking, climbers, photographers and millions of others every year. 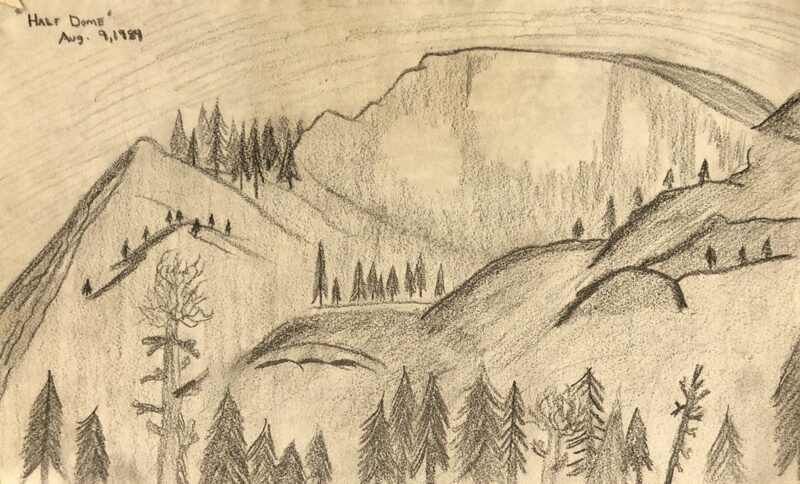 It’s unmoving and unchanging form, looking the same as in old pictures with Abraham Lincoln, Teddy Roosevelt and John Muir, is a powerful testimony to the unchanging nature of our Creator God. Spotting wild life is always a treat. 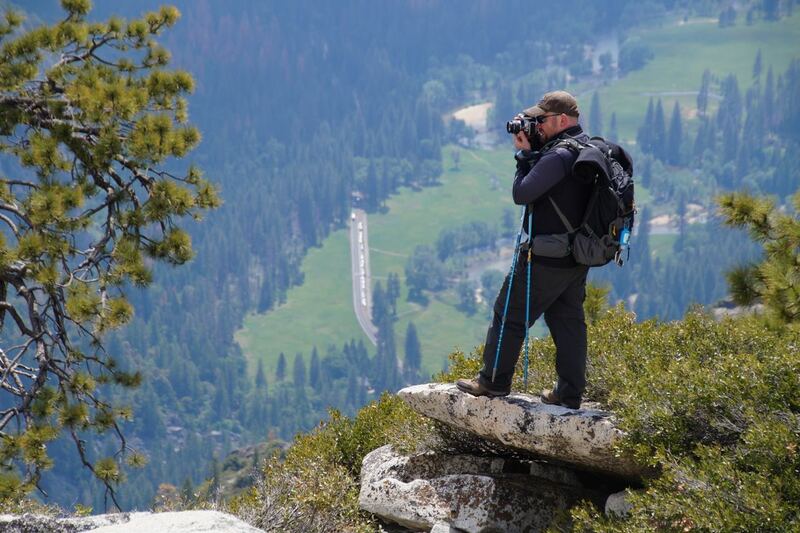 The birds, deer, turkeys, squirrels, chip monks, marmots, lizards and even bears are always a delight to see, and if we are lucky enough – to capture a picture of. 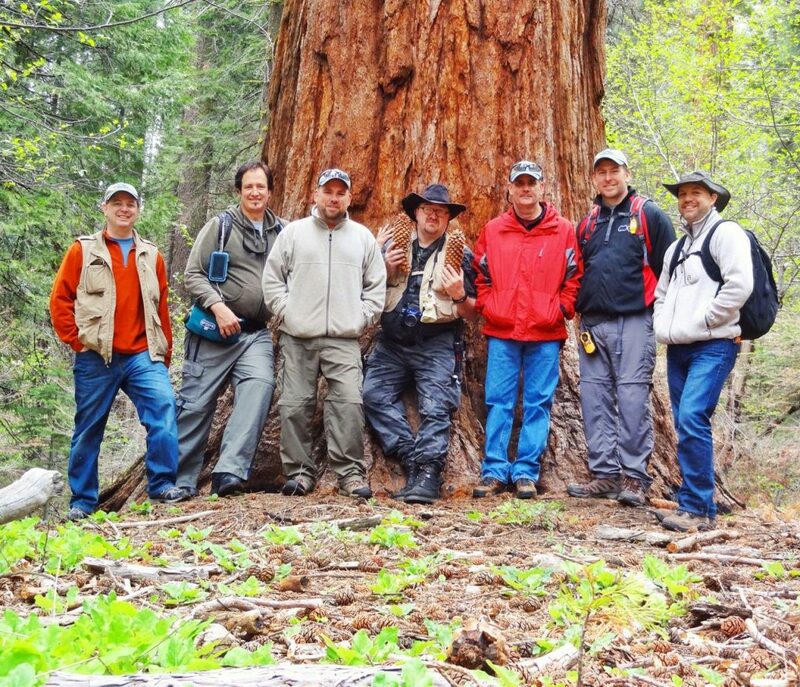 When we have those rare moments where we are all together at the same time and place on the trail, I try to get group pictures whenever I can. 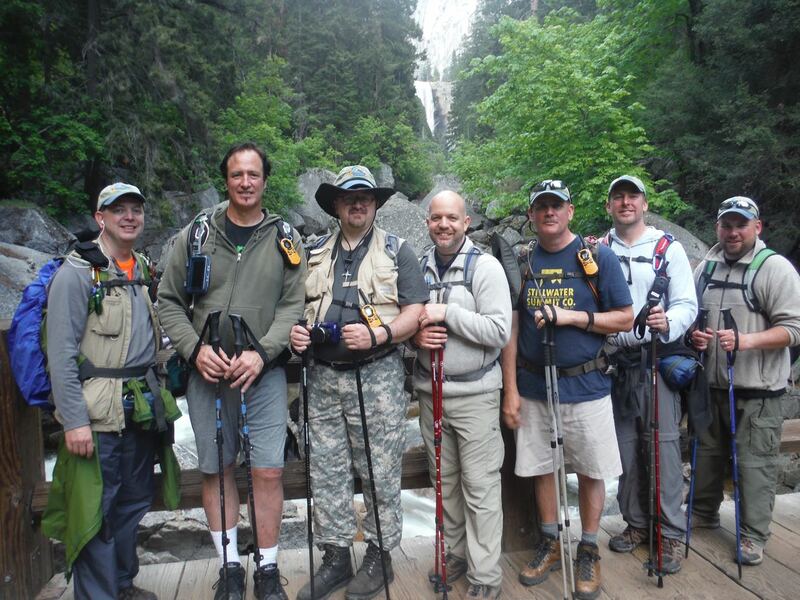 I can look through pictures from every year and so many memories come back – every year is so unique – not only because of the varying weather and the different hikes, but because of the unique combination of guys that join together for this week. 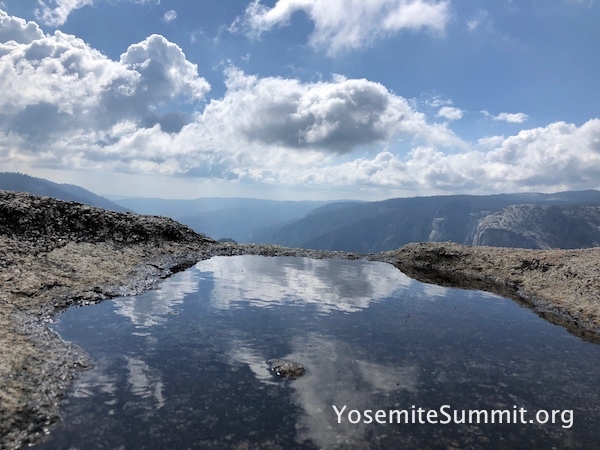 One of the things that amazes me about the Summit, is that while normal weeks seem to fly by, and I find myself thinking, “Wow, it’s almost Sunday again.” The Summit goes at a pace that almost makes it feel like much more than a week. Surely, on the last day, we feel that. “It’s over” mix of sadness to leave, but eagerness to get back to our families and the ministries we love. 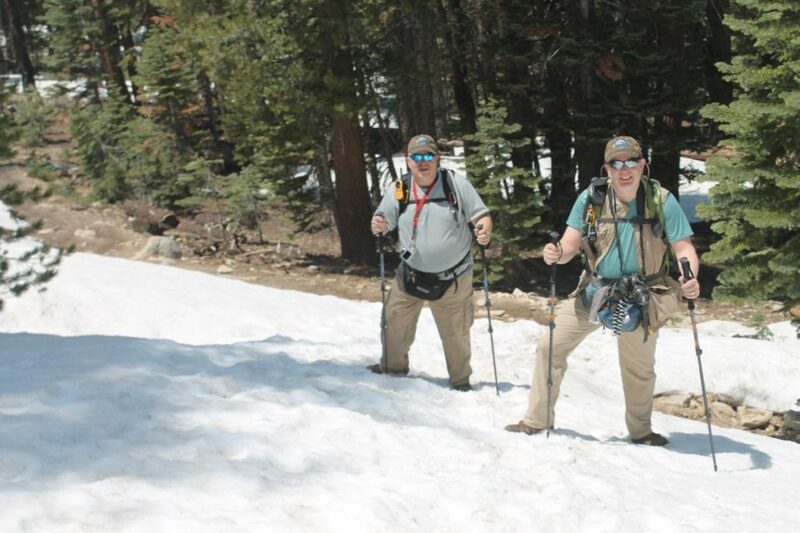 This year, due to heavy snow fall, we got to hike in some snow for portions of hikes – and yet it wasn’t cold. A few of the guys even decided to slide down the backside of Sentinel Dome head first, and lived to tell about it! This is one of my “secret places” – I won’t even post online where it is. It is a place where we avoid the crowds of Tunnel View with tour buses and countless tripods and cameras and get our own private view of the same famous Valley view, and even have some giant boulders to climb on that look like they are about to roll down the mountain – but if they haven’t yet, what’s the chance they will now while we are climbing on them? In closing, the guys have come to love these AREA CLOSED signs you see around the park. One of the guys this year got to take one home when they happened to be nearby as one was being replaced and they asked if they could have the old one. Why are they meaningful to us? Because they describe why we are here. For one week we are CLOSED. No ministry meetings, e-mails, voice mails, texts, lessons to write, events to plan and the countless other things that fill a normal week. 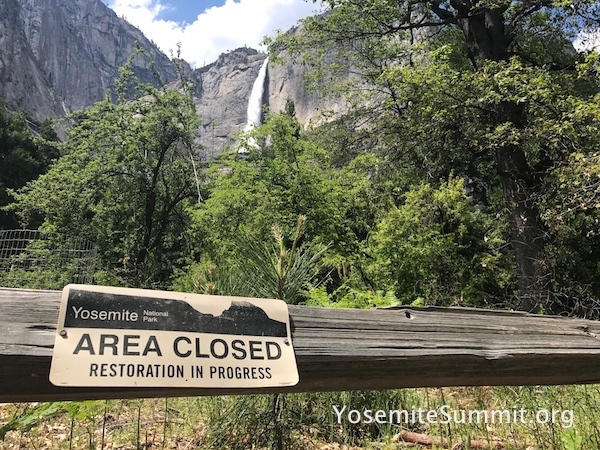 For one week we say, “Sorry, I’m closed.” And the reason is, RESTORATION IN PROGRESS. 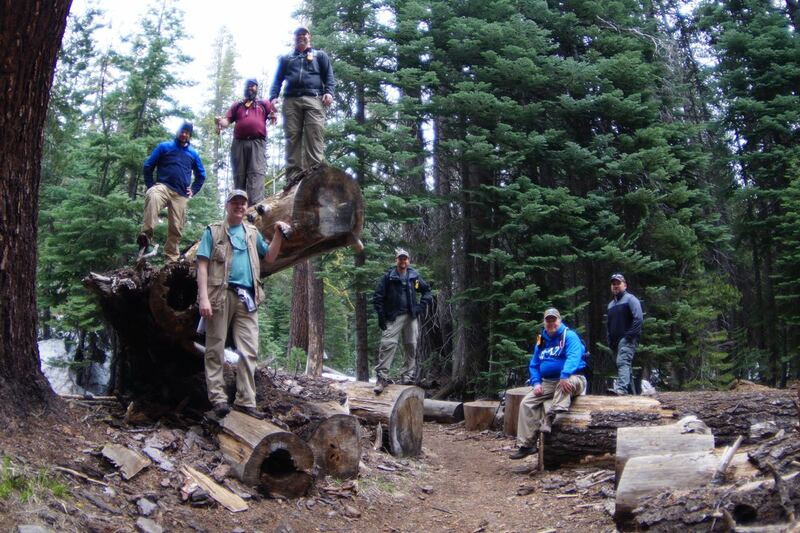 Guys come to the Summit exhausted, weary, sometimes even discouraged and asking God what’s next? Not everyone is in crisis though – if we are wise, we’ll do something like this before we find ourselves in crisis. But regardless of what is going on “back home,” they all come to hit “pause” on the hussle and bussle of ministry life so they can just enjoy some time with God. 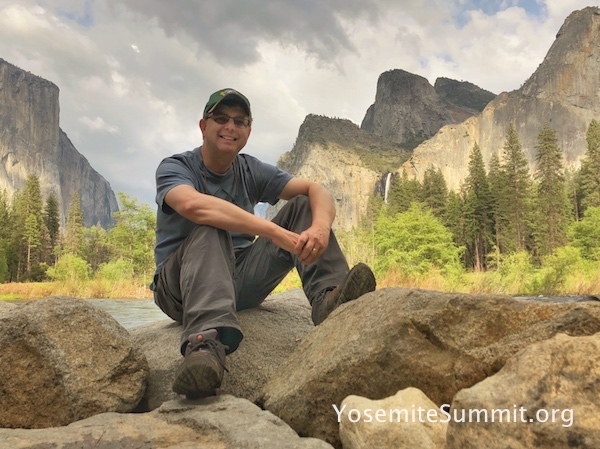 The most challenging ministry secret I was ever given was, “Ruthlessly eliminate hurry from you life.” It is a constant pursuit of mine, and Yosemite Summit is my annual occasion to hit the reset button and stop the ministry train and rest. Perhaps you’ll join me on a future Summit? 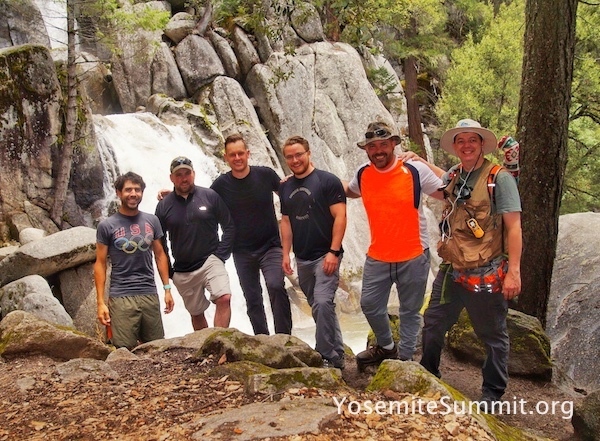 By the way, since the Summit has been filling up quickly the last few years with guys wanting to come back, for 2018 as we start the next ten years of Summits, I am opening the Summit up FIRST to new timers – but there is a waiting list of guys who are eager to return, so if this is something you want to do, register SOON – the event always fills up fast because it is the only event of it’s type for children’s pastors. 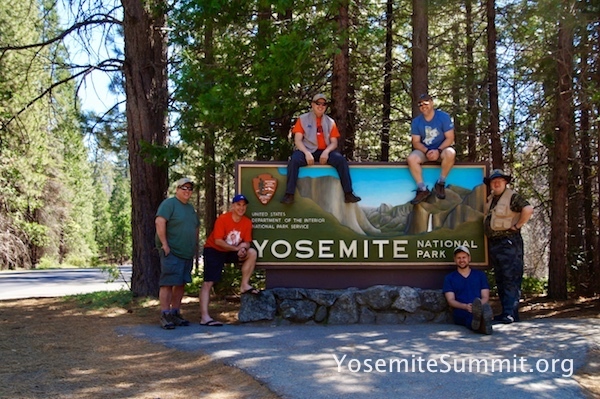 Yosemite Summit 2016 was an amazing week! Like last year, there was rain in the forecast, but seemed to avoid us. We had to change plans, but the hikes we did were incredible, and the one time we hiked in rain, it was actually amazing as we liked through lush greenery along a raging river. We all ended up saying it was the best way to do that particular hike, and as you’ll see below we enjoyed blue skies for most of the week. We truly saw God’s Hand of provision as we walked with Him! I marvel every year how God brings together just the perfect group of guys. It is now always a great blend of repeat Summiteers (as I call them) and guys who are experiencing this for the first time. 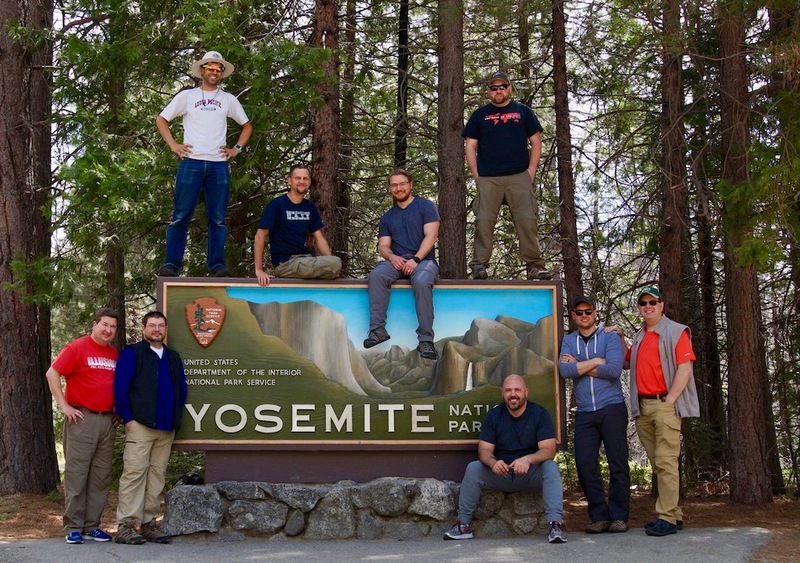 While Yosemite never gets old – it is fun to see the awe in the guys who are seeing it and experiencing it for the first time. As always on this site, you can click any image to see it larger. 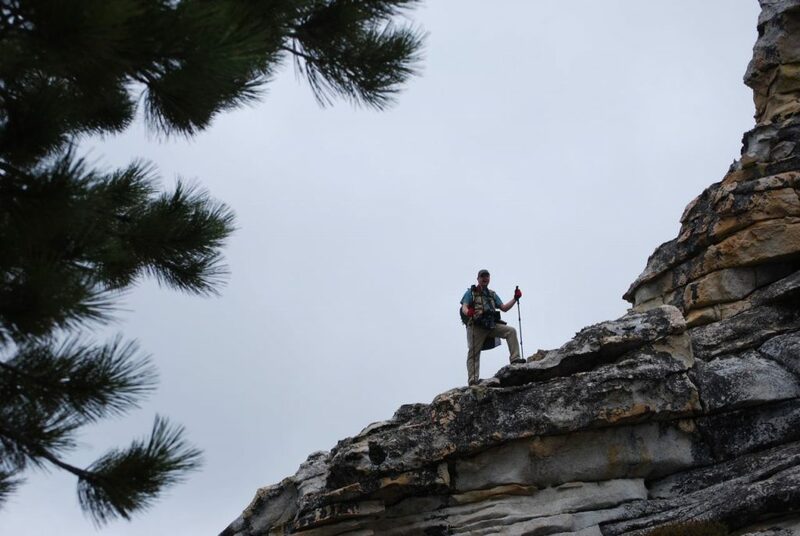 If you could see where this rock sits, you might think twice about climbing up on it. But we do anyway. If it hasn’t moved in thousands of years, would it really today? After over a dozen hiking trips here, I have discovered some of the most amazing places. While literally millions of people visit this National Park every year, most of them remain in the Valley looking up. I have discovered the hikes where we can enjoy not only solitude, but spectacular views. This particular location (I won’t post the name online) provides a better view than the famous Tunnel View without the buses and crowds – and this rock that appears to be about to roll down the hill to crash in the Valley below. 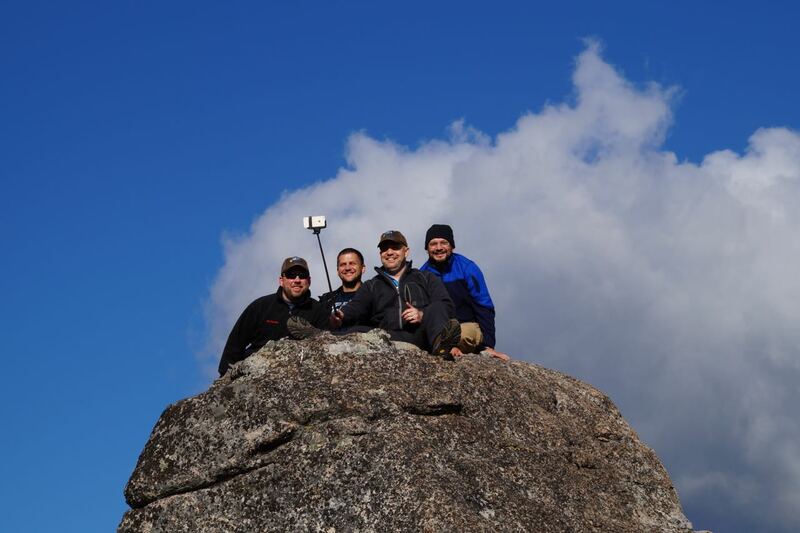 A selfie on top of this amazing rock! And here is the picture they took! 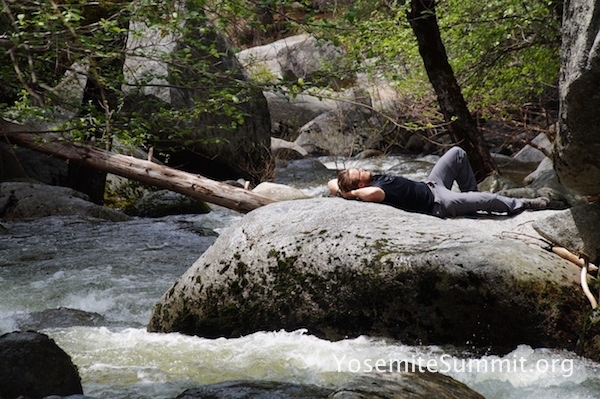 Yosemite Summit offers the time, place and atmosphere to just soak in the presence of God – unlike anywhere else. It is like God places cool things to find all over the place. This perfectly round and hollowed out hole was fun to jump into for a picture, but not so easy to get out of! 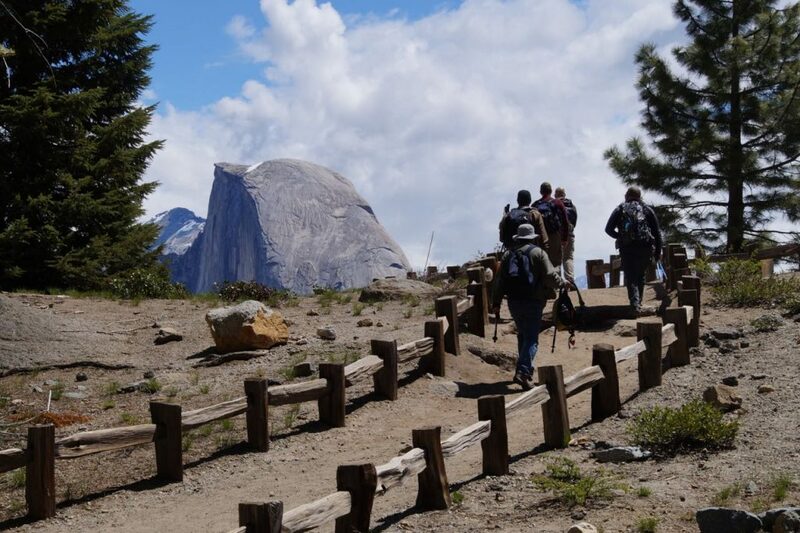 Of course, hiking is a big part of Yosemite Summit – but the goal is never to finish the hike – it is to enjoy fellowship along the way, to marvel in our Creator, to listen to His still small voice, and to spend time in conversational prayer as we walk. 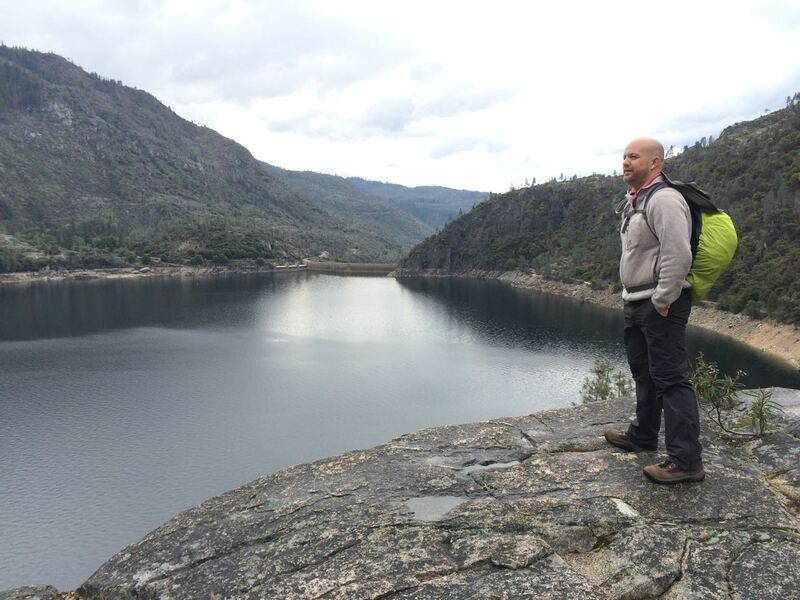 The variety of landscape, climate and geography is simply incredible. We can be hiking on snow for a bit, and then not much longer be stopping to remove a layer because we are getting warm. 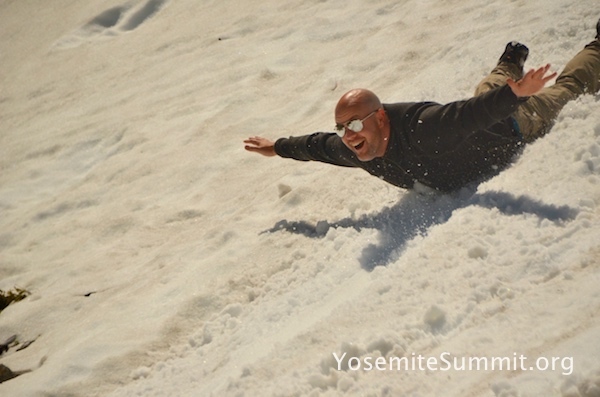 You have to dress for a range of temperatures from the 60’s to 80’s on most days in Yosemite in May. 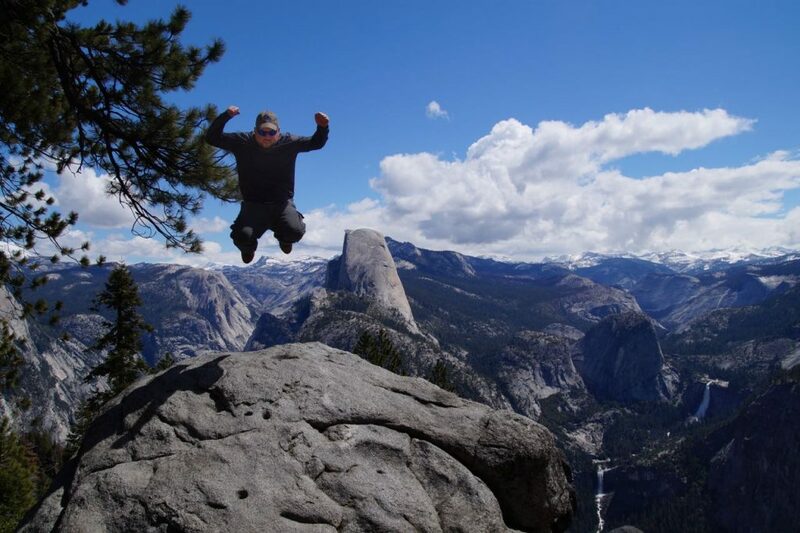 One of the things you gain in Yosemite is a sense of perspective. Both literally on the heights, as well as about life, ministry, family and our walk with God. 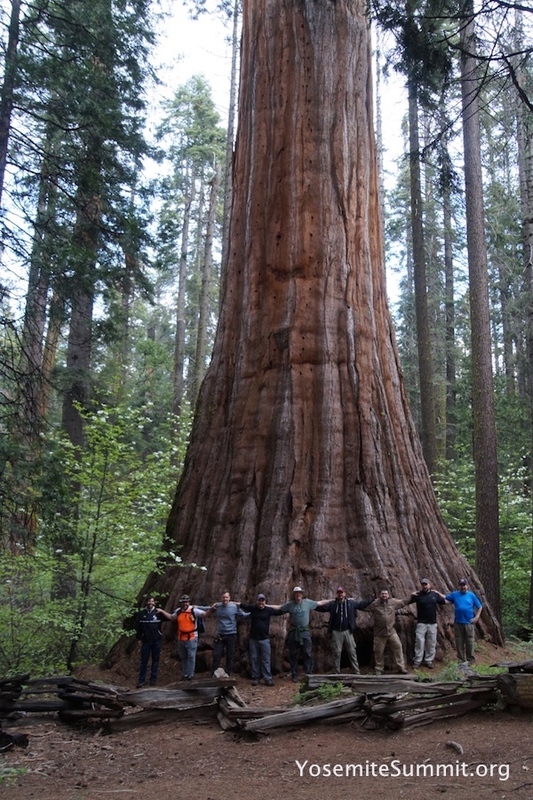 A group picture as we walk among giants. 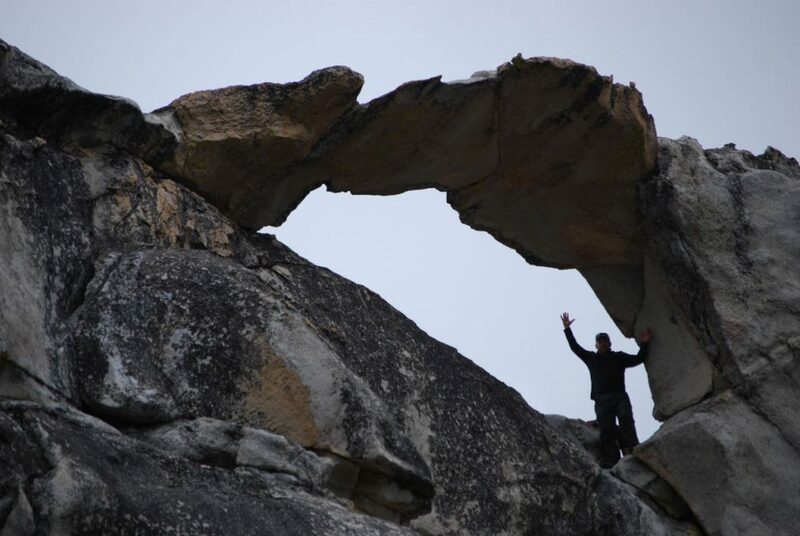 I was excited after several years of changed plans, to finally get to see the Indian Rock Arch. My creative climb up the back side resulted in a dead-end and back tracking, but I still enjoyed it. Pat followed the designated path and was able to get all the way into the Arch. Hmmmm…. there is an object lesson there somewhere. 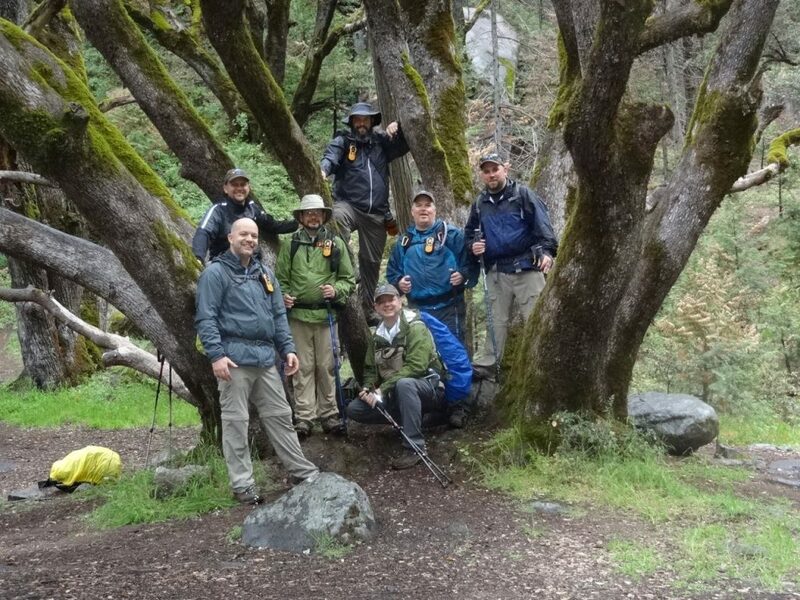 On our rainy day hike, it stopped at lunch time so we could relax and eat. Is that a cool tree or what? I always knew Doug had multiple personalities – but I finally got photographic proof. 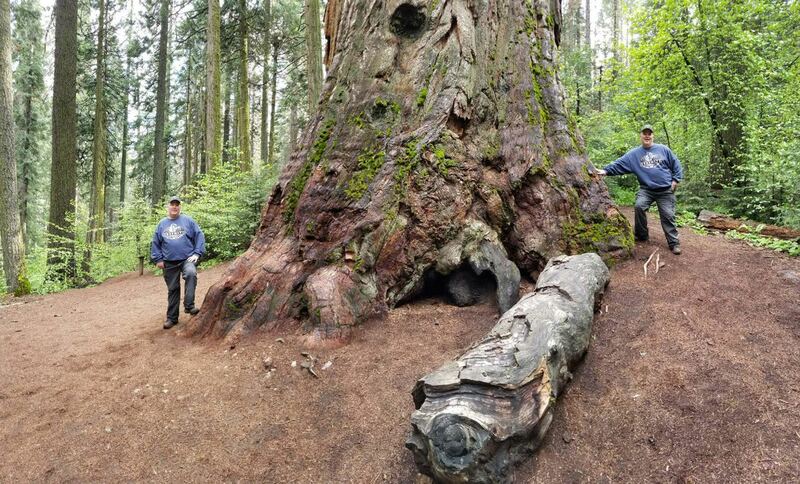 When we got to this tree I showed the guys how to do a panorama picture that you are in twice by running behind the photographer after he starts and get into the end. We must have spent 20 minutes taking fun pictures! 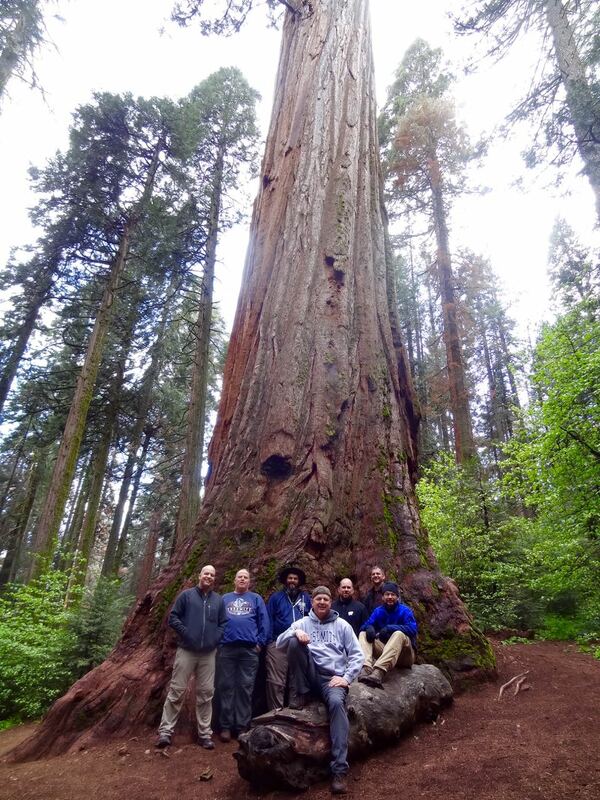 The funny thing was, when we got to this tree and wanted to do a group photo, there was a family of four also enjoying it. We kindly asked if they would mind hiding behind the tree for our picture. They were happy to do so, but then we got to doing our panorama pictures and forgot they were behind the tree. Fifteen minutes later the dad politely peeked out and asked if they could move on? We were so embarrassed and apologetic, we had forgotten they had ducked behind the tree for the first picture! Glacie Point is always amazing. 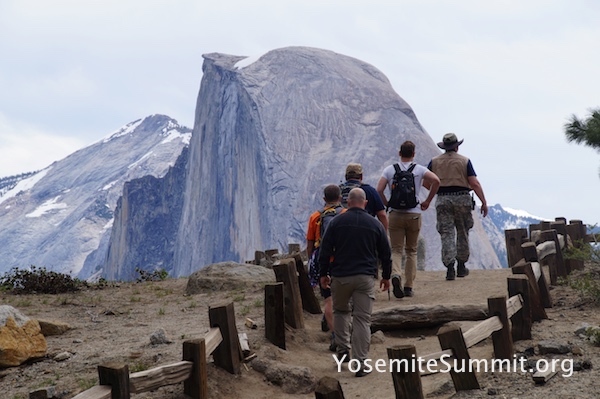 As you approach it you are overcome with awe as Half Dome begins to tower above the skyline – I’ve been accused of photo-shopping when I have posted pictures from here. It just really is this amazing, in fact, more so when you see it in person. 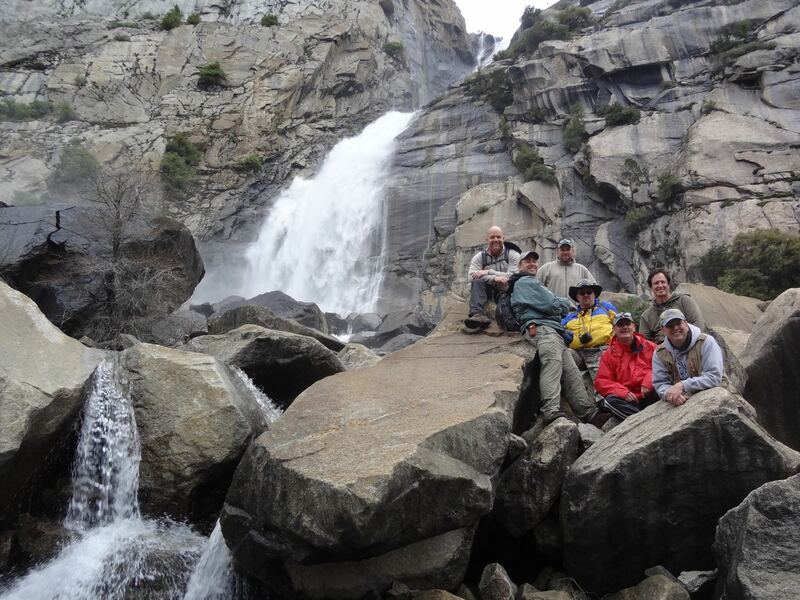 It’s a popular and so crowded spot – it took some patience to get a group photo without others in it. 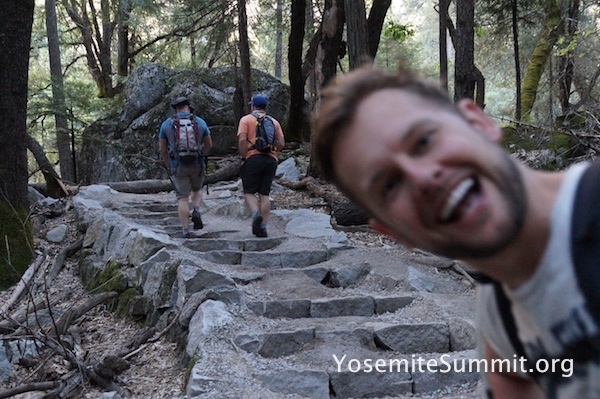 This was Pat’s 4th Summit – you can tell he is pretty excited to be back in Yosemite! I found a nice place to sit and enjoy the view away from the crowds, since not many are willing to go out on the ledge at Glacier Point. Yea, it’s about a mile straight down. 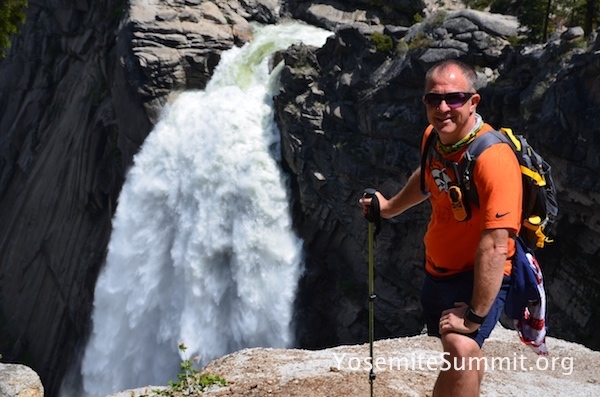 The final day of Yosemite Summit is bitter sweet. It has been an incredible week – half of you wants to never leave while the other half is eager to take back into daily life the Peace and Resolve that was gained here. 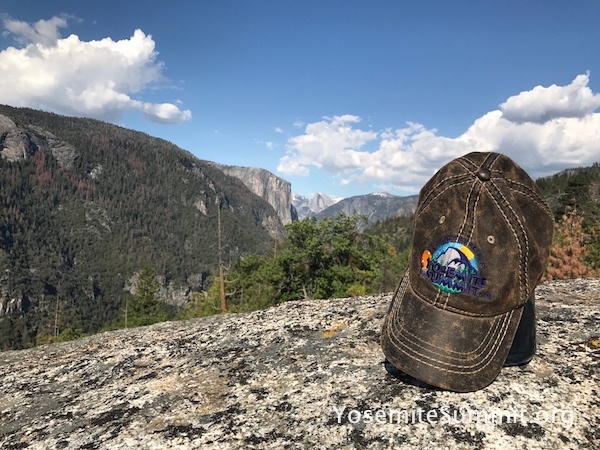 Family is missed, but when you leave Yosemite you take a part of it back with you in a deep place where it is never lost. 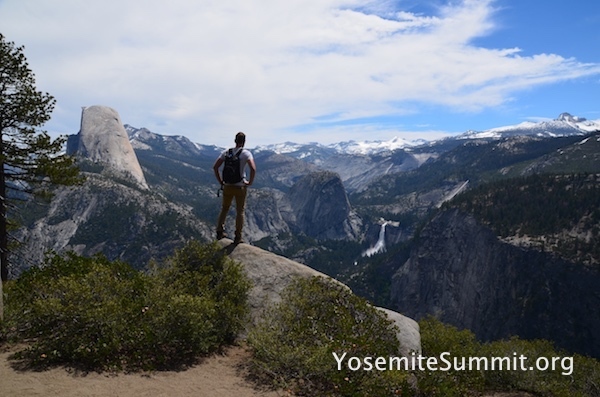 It is why so many have come back to Yosemite Summit more than once. 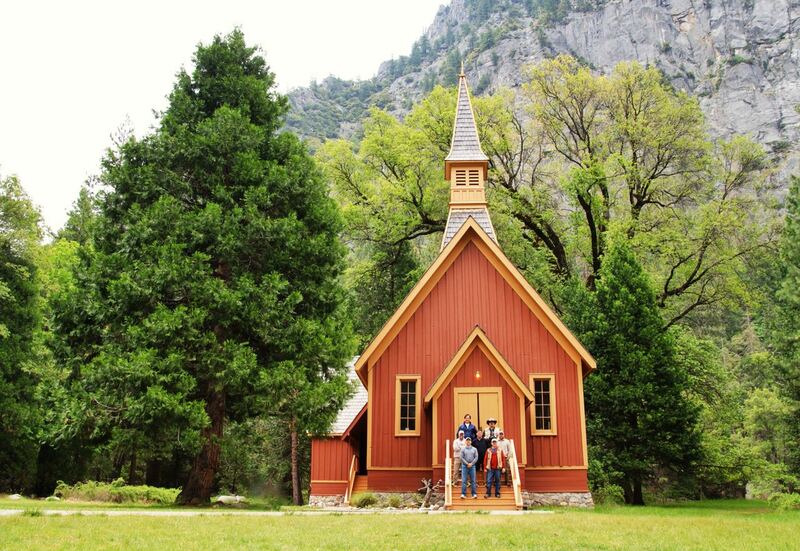 We always end the Summit at Yosemite Chapel, a still functioning church that has been a part of the Valley since 1879. We enjoying singing hymns about Our Mighty Fortress, Our Help in Ages Past enjoying songs that fit the setting – As the Deer or Higher Ground – as we rejoince that It Is Well With Our Soul. 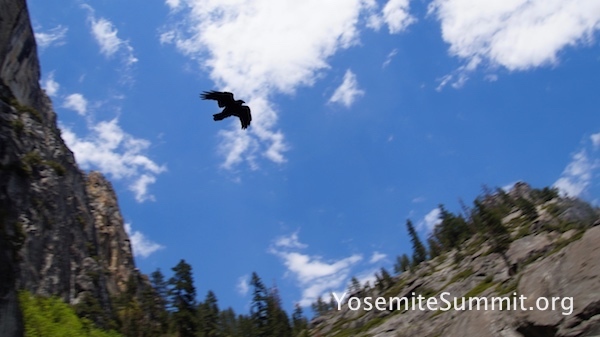 Perhaps one day, you’ll be singing with us when you join me at Yosemite Summit. You may notice this 2015 Report is being posted well into 2016! (The 2016 Report to follow!) 2015 was an exciting year for me as I had accepted a new children’s pastor position the day before the Summit – when I got back home it was right to work, and while I got the video below done, I never got around to posting this! I didn’t even notice until I finally went to write the 2016 report. So while it will be brief, it is always good to return to the pictures of previous years and to have the incredible memories of this unique event come suddenly and so vividly back to the mind’s eye. 2015 was an amazing year in some unique ways. The weather reports were ominous and the unspoken concern among all of us was whether rain would dampen our event. 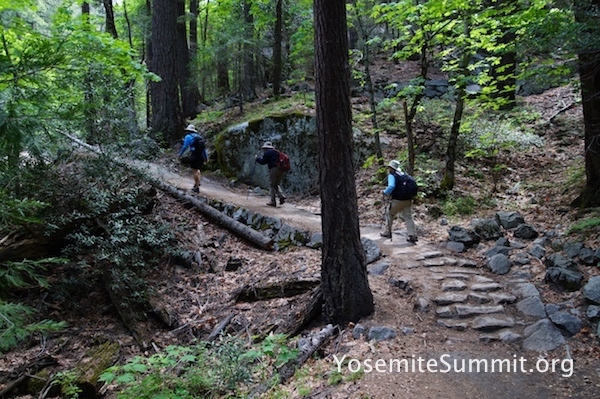 Nevertheless, we headed toward the Yosemite Valley. 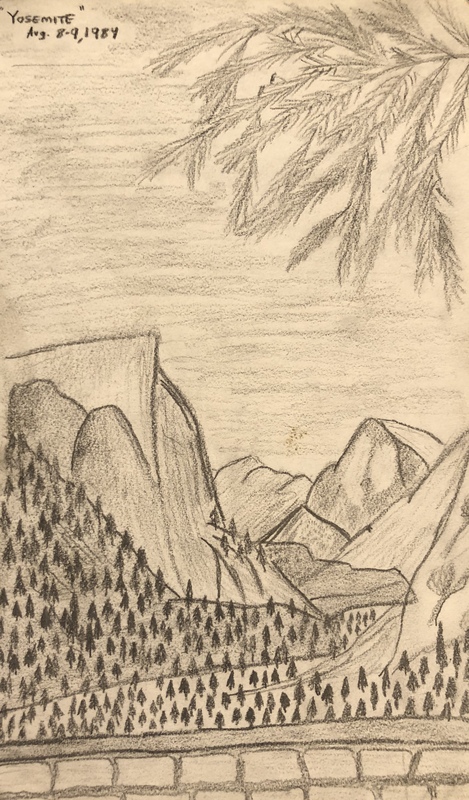 As it turned out, everywhere WE went, there was little to no rain – while we heard reports from others of heavy downfalls in places we didn’t go. It was like the rain moved around us and the Light of God literally shown upon us all week. We marveled at His grace and provision as we had a wonderful week filled with beautiful skies abvoe us and dry paths under our feet. 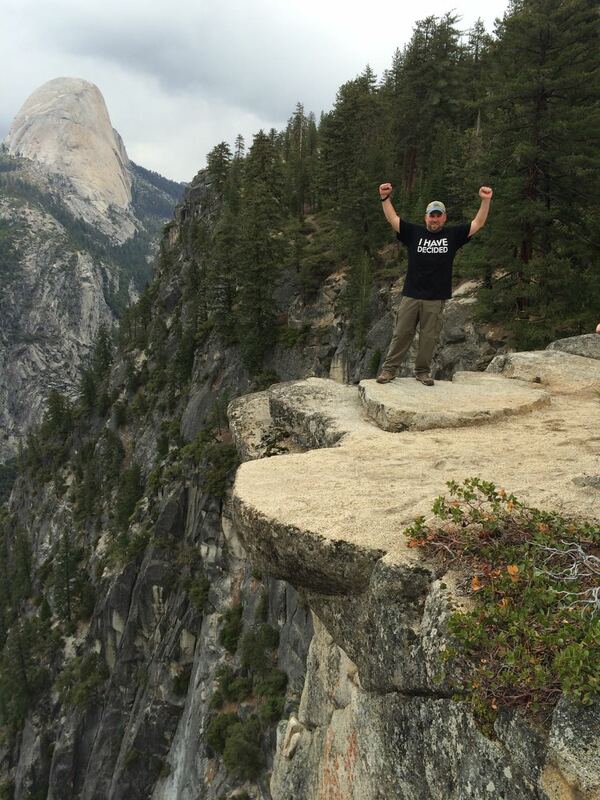 The views in Yosemite are beyond description. While the pictures are spectacular enough, they don’t come close to capturing what is seen with the eye and felt within when one is trying to take in these vistas. But as I am often encouraging the guys, there is beauty in the small details as well. Often overlooked when there is a towering waterfall in the distance. 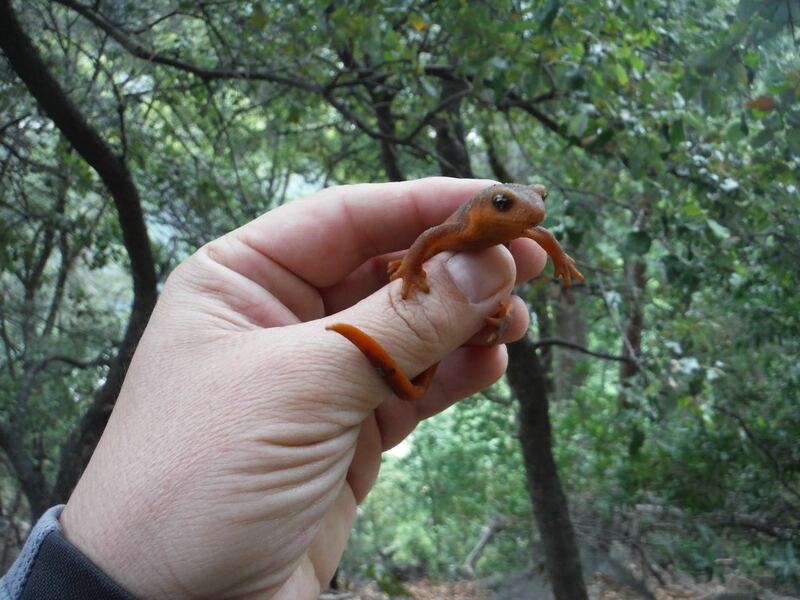 Like this bright orange salamander we found on one of the many trails we hiked. 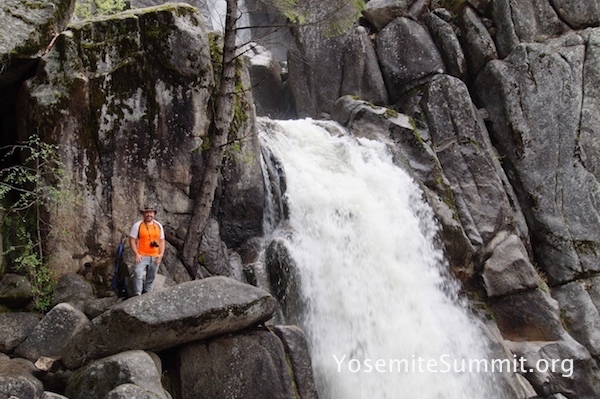 The water falls along this hike were spectacular. 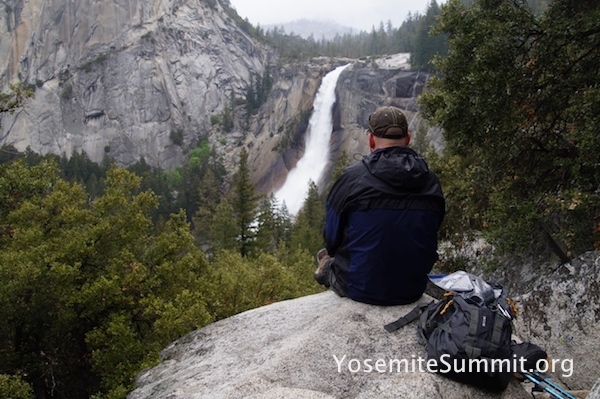 Especially when you realize that you are looking at what was once only the top of much longer falls that once fell to the valley below that is now filled with water. 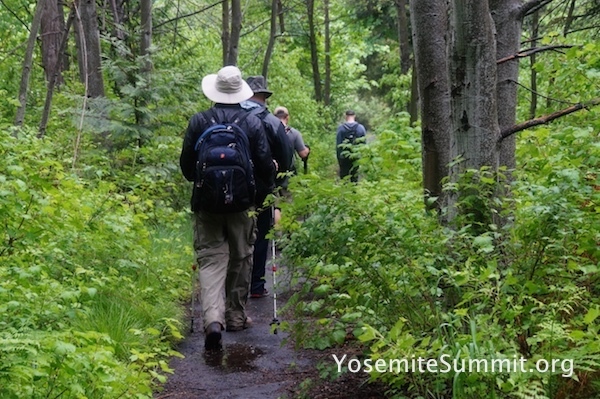 We also hiked the Panorama Trail – a hike that I try to do at least once every other year – it is one of the longest and yet most scenic hikes in the valley. Being this close to a display of God’s Power is breath-taking. A few seconds of denying fear is often taken for a picture and then quickly retreated. 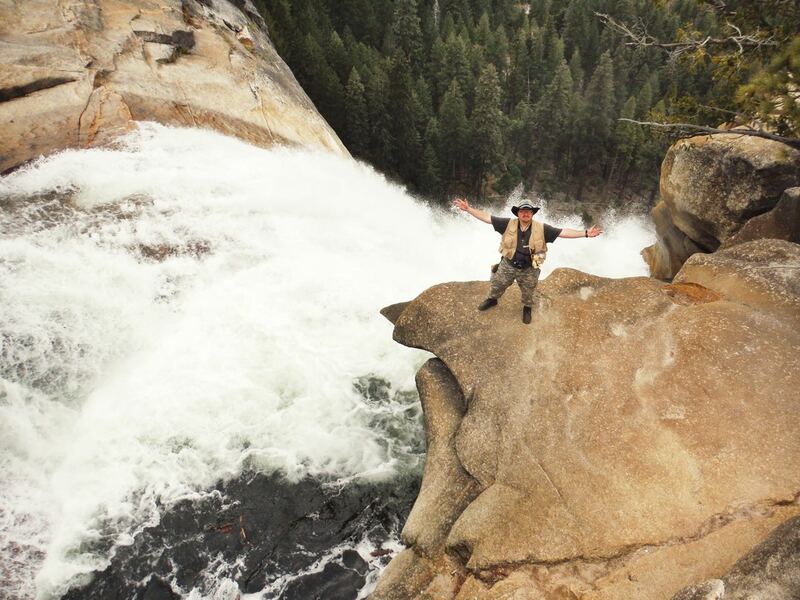 This is the top of Nevada Falls. 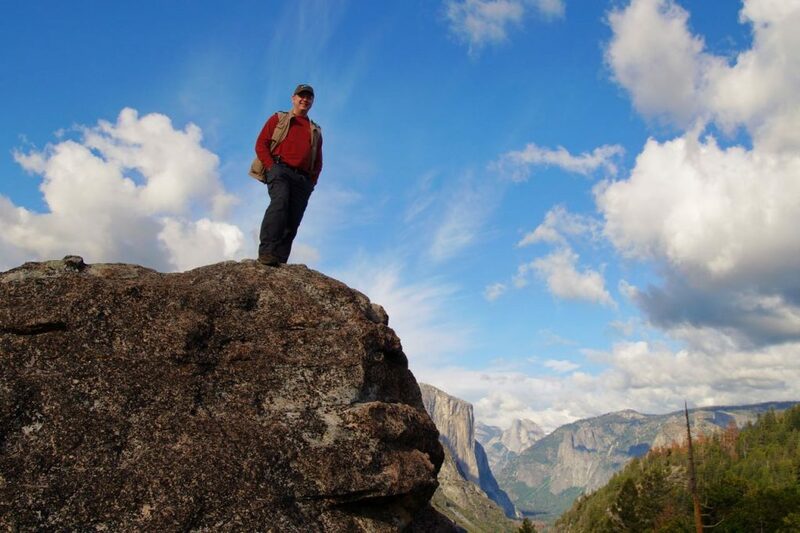 Half Dome is always a view that can’t be passed up. 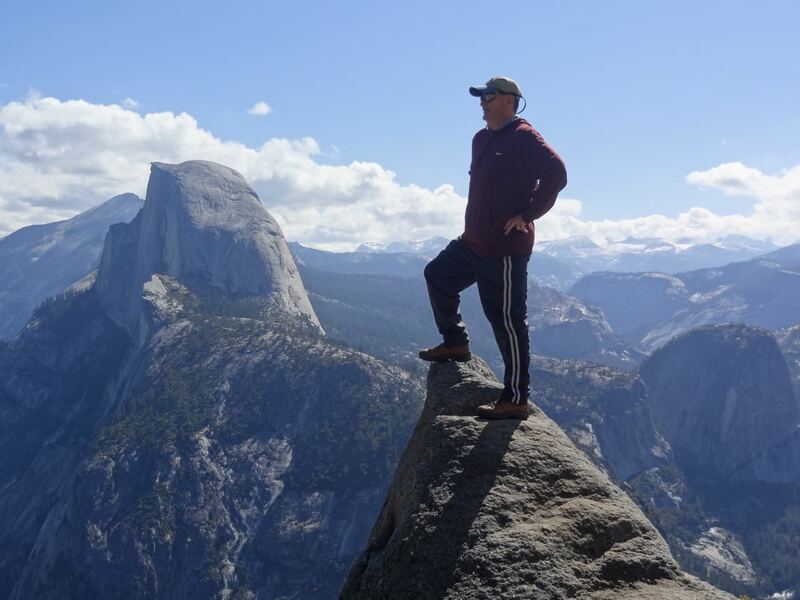 It is both daunting and awe-inspiring and is one of God’s monuments that can be seen from so many hikes and is unique in the many views it provides as we often hike around it. Another view from behind almost it at Panorama Point – a small viewing point that most hikers miss. 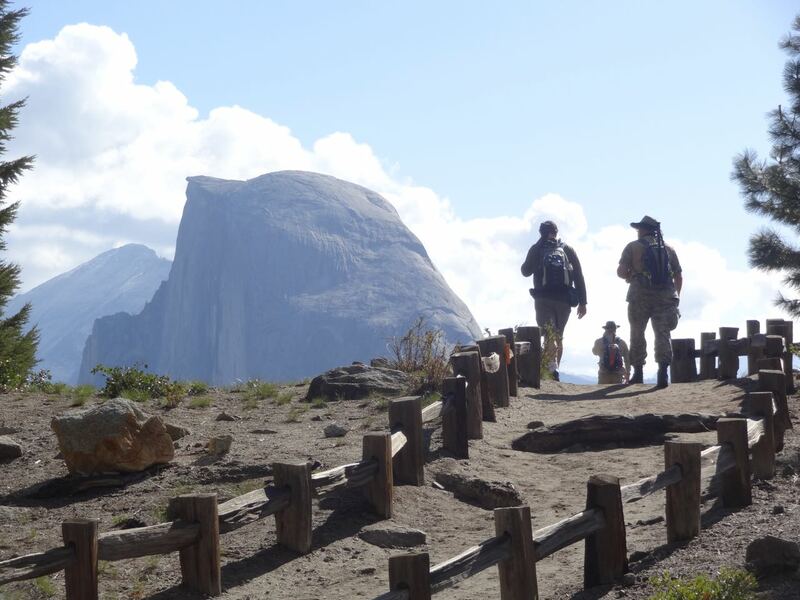 It is an unmarked side trail to a spectacular view. The few brave ones can lie down and look directly down into the valley. 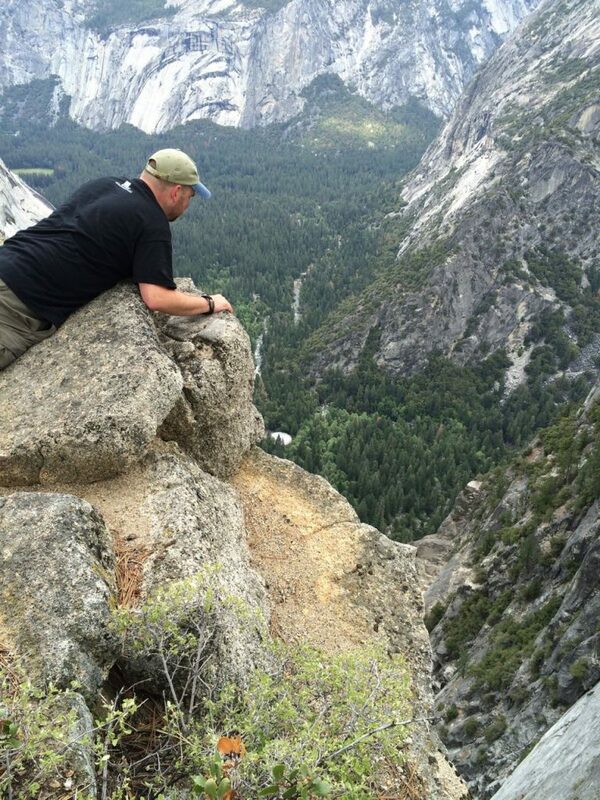 Words can’t describe the heart-stopping feeling of looking directly down several thousand feet! It’s hard to feel down when you are on top of the world. 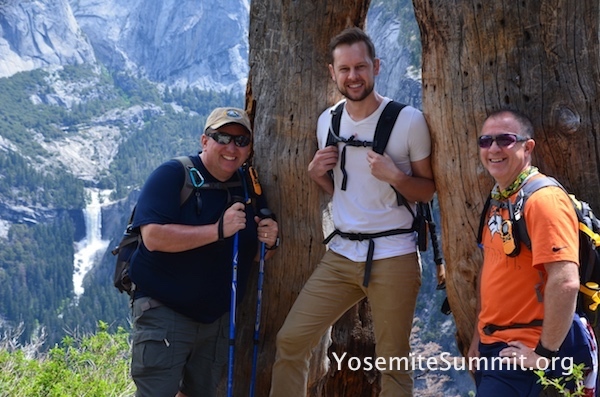 Yosemite Summit is a journey, both literally along the trails, but also for each guy as we share our spiritual journey, ministry challenges and share advice, ideas and life experiences. 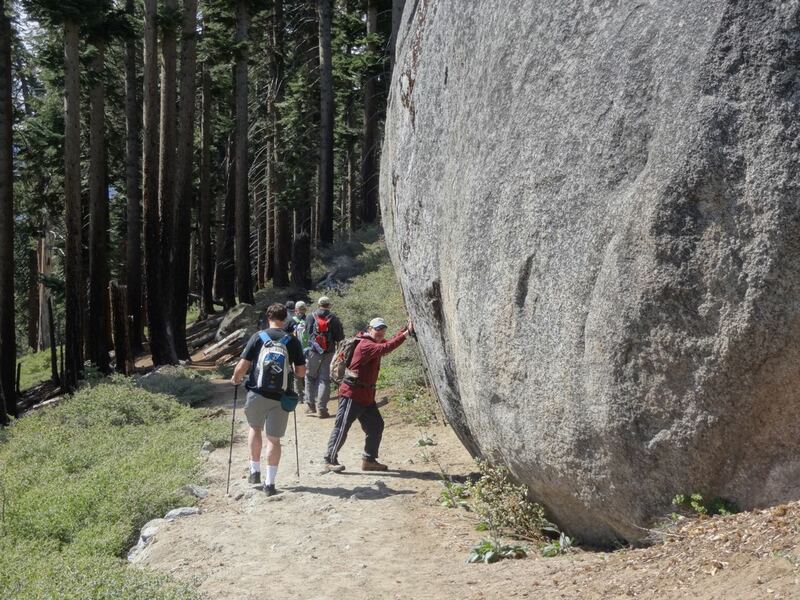 Once in awhile, one of us hold back a rock so the rest can pass safely by. It’s fun to keep an eye out for unique spots. What you can’t see in this beautiful picture is all the BUGS in that tree! 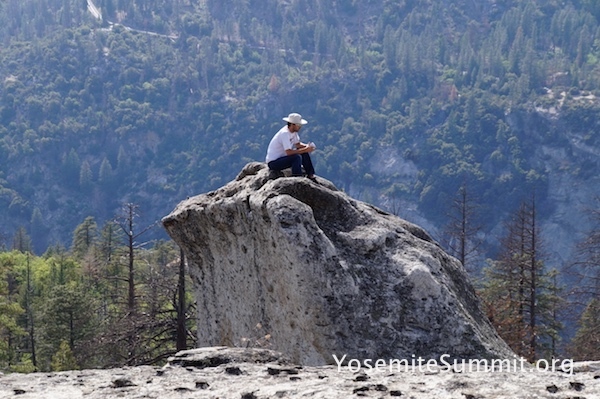 But Yosemite Summit offers the opportunity to meet with God in a place where His Presence is so clearly felt and experienced. 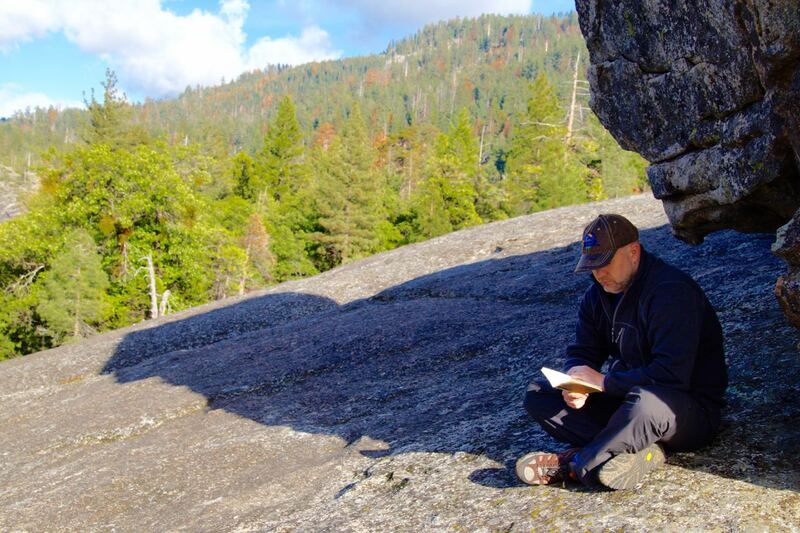 It’s a time to think, reflect, pray, journal and open God’s Word in a place where His Words are all around us. 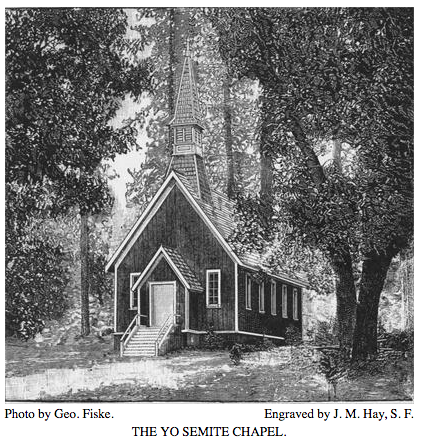 I often like to joke that Yosemite is the closest God ever got to sin, since He kinda showed off a bit. The water fall above is in a hidden unmarked area I discovered a few years ago when I went the “extra mile” past the water fall that bears the hikes name. A cascade that is either seven or ten cascades. 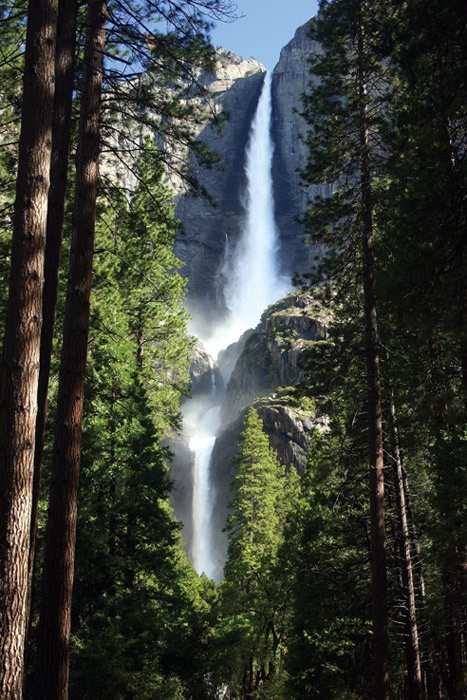 We enjoyed arguing over how many water falls this actually was because they aren’t clearly defined… but it was amazing. They just keep on going. 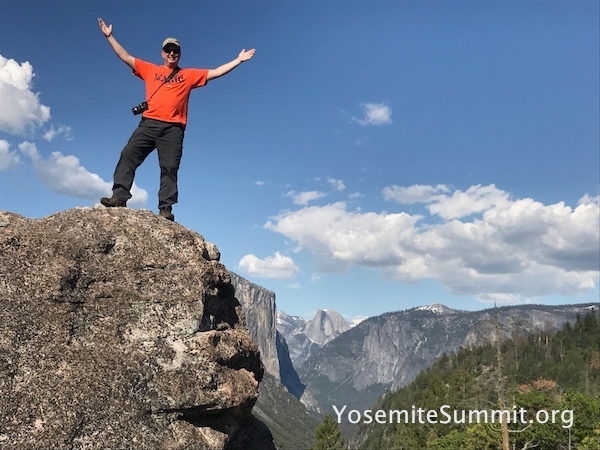 Yosemite Summit is filled with surprises, life-defining decisions, personal object lessons along the trail and a fellowship unlike anywhere else. 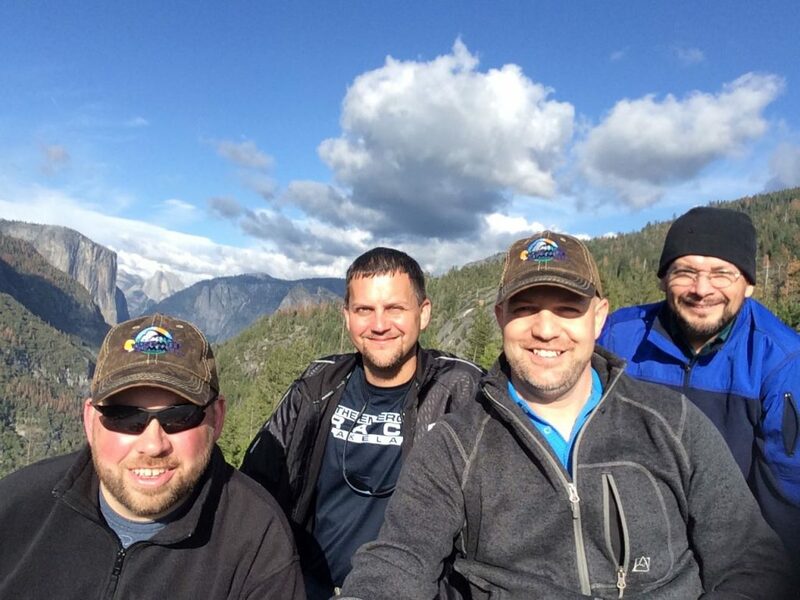 I have been so blessed by God to have some brothers join me on this Adventure every year. 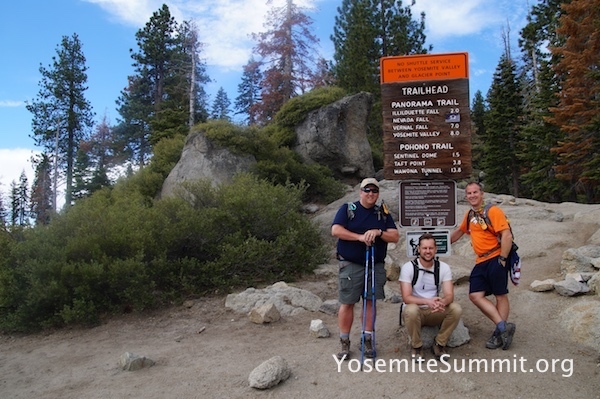 If you are reading this site having never been to Yosemite Summit, perhaps one year you will hike with me too. 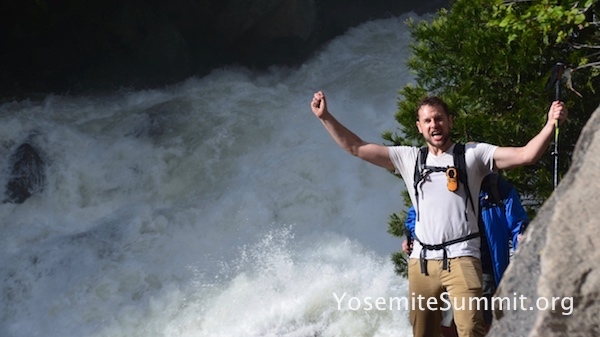 Yosemite National Park is home to some of the world’s most majestic water falls and grandest granite cliffs. There is so much that is HUGE in Yosemite, that if one isn’t careful, they can miss the small wonders that lie around almost every corner. One of the most fascinating things you discover getting out of the paved Valley and up into the winding hiking trails is how nature and weather have impacted everything that grows there. Very often you will see a tree that holds within it an untold tale of past tribulation. 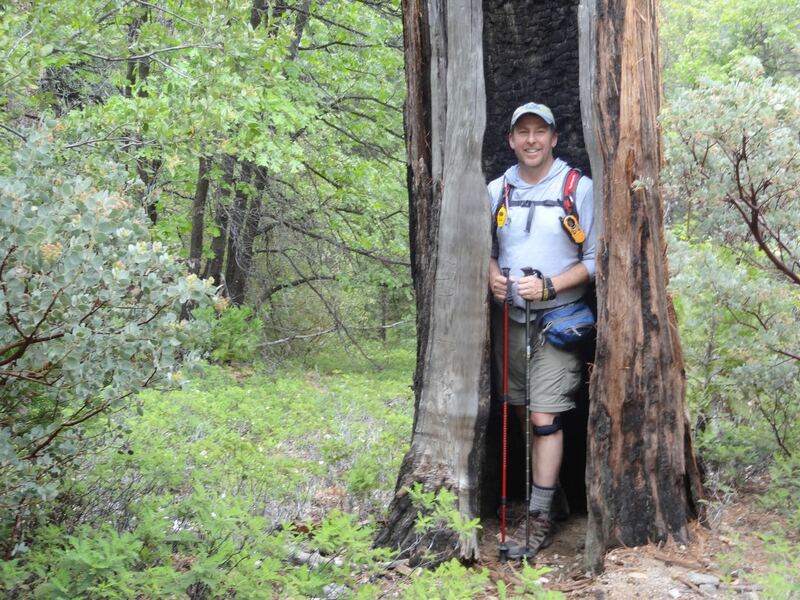 For example, last year, along the trail to The Tuolumne Grove of Giant Sequoias I noticed this tree coming out of the hill beside me. We learn as children that trees naturally grow in a straight line toward sunlight, wherever it may be. But their path upwards can be dramatically hindered by wind, storms, lightening and other traumatic events that occur in the forest, often never seen by people who aren’t hiking during those times or conditions. As I looked at this tree I couldn’t help wishing I had a stop-motion film of what this tree had lived through in order to be shaped so dramatically into this letter “S.” It is obvious to see where it has been bent, broken and twisted from it’s desired shape and direction, and yet, nevertheless, it points upwards. Aren’t we like this tree? What, then, is the secret to surviving and thriving through these storms, set-backs and hurts? Trees that perish are soon forgotten. Those that keep growing overcome these set backs and become noteworthy. Here is the glorious part. As I was hiking I passed countless tress that pointed straight toward the sky, never wavering or bending, and yet, few of them caught my eye or merited my raising my camera to capture the memory of them. 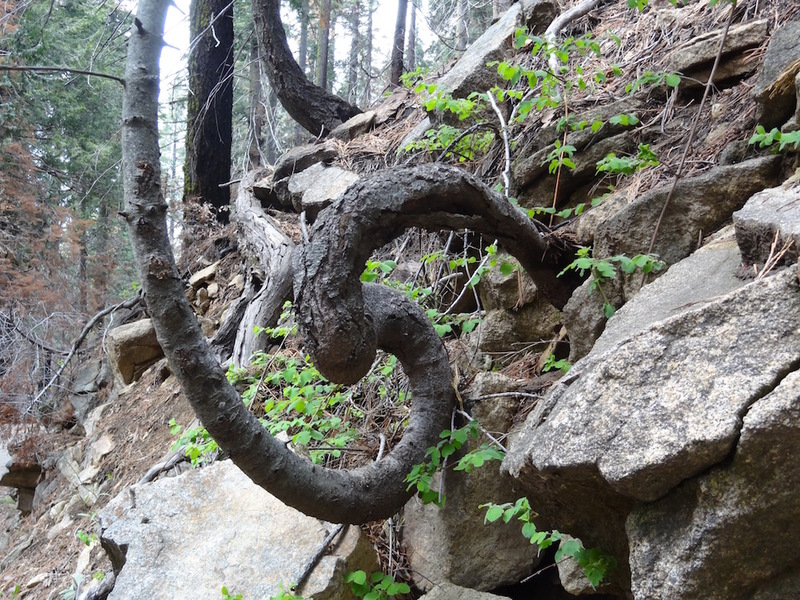 But this tree, twisted, bent and broken – yet surviving gave me pause to stop and admire. It’s scars made it beautiful. They are a testament to it’s steadiness, perseverance and sheer will to survive. As it reached for the sun, despite it’s past, this tree became something that stopped me in my tracks. The same is true for us. We may have brokenness and bent histories. We may have endured torrential storms. We may not appear the way we thought we’d be nor life be what we had hoped – but if we continue to grow, we ironically become even more beautiful to a world that is watching. Those who are straight and perfect can be commended for their steadfastness, but it is the damaged ones that still reach up that give us pause and earn our attention. They glorify God in their uniqueness and their stubborn determination to keep growing toward the Son. So never stop growing and embrace your scars – they are living proof that you follow a God who heals and redirects and who will make beauty out of deformity. It’s OK to be a twisted tree. Just keep growing and you’ll bring glory to God.